In preparation for the holiday, we will first think over the menu. 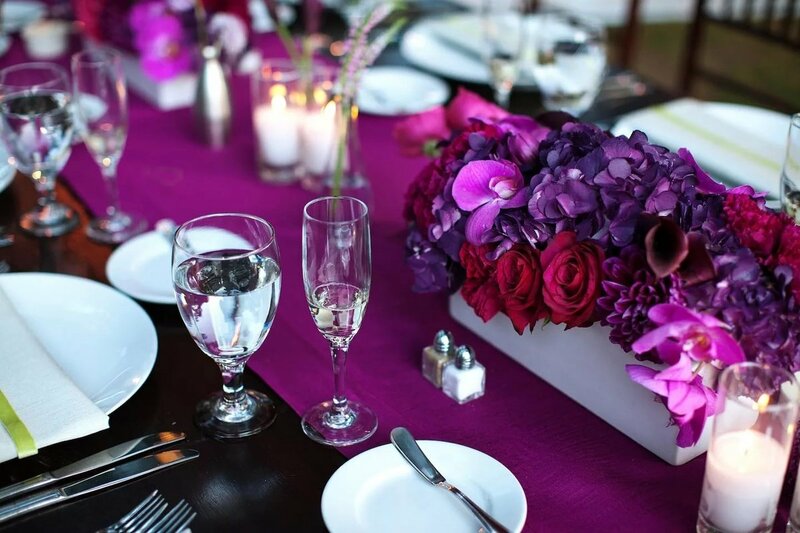 Of course, refined and creative cuisine and drinks – honorable “guests” at our table. And to underline their significance, palatability and beneficial to shade will help wonders virtuoso servings. 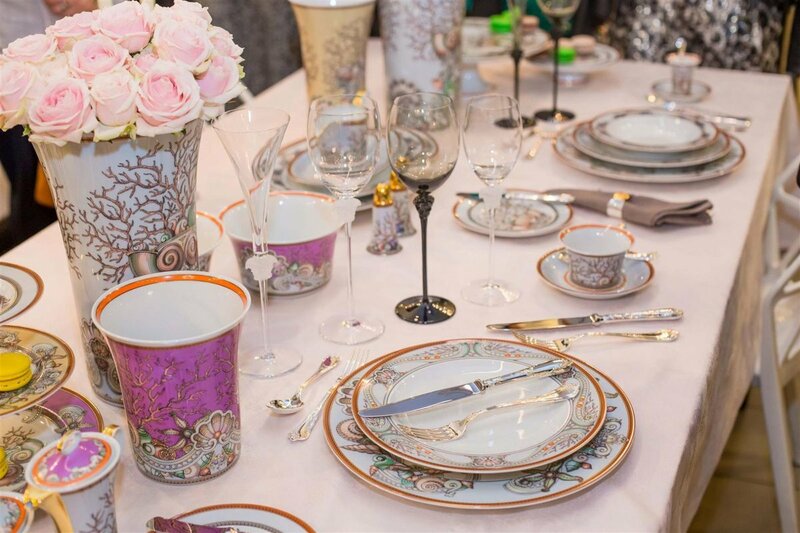 It is important to think through every detail, each a “note” to “Symphony”, created from porcelain, textiles, crystal, flowers and metal sounded in unison with one or another event in your life. 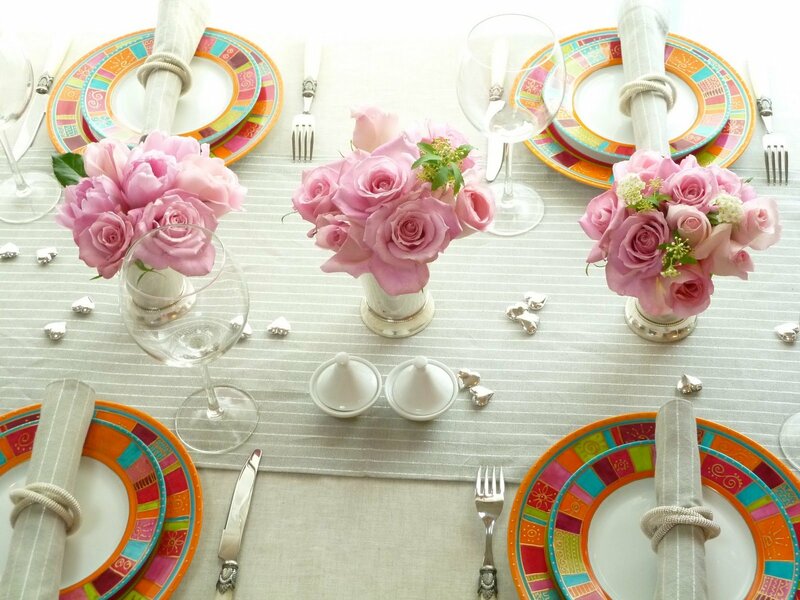 To decorate the table correctly is an art that you should definitely master. A variety of options serving amazing. But every creative decision is based on a clear framework that includes not only the rules of arrangement of plates and devices. 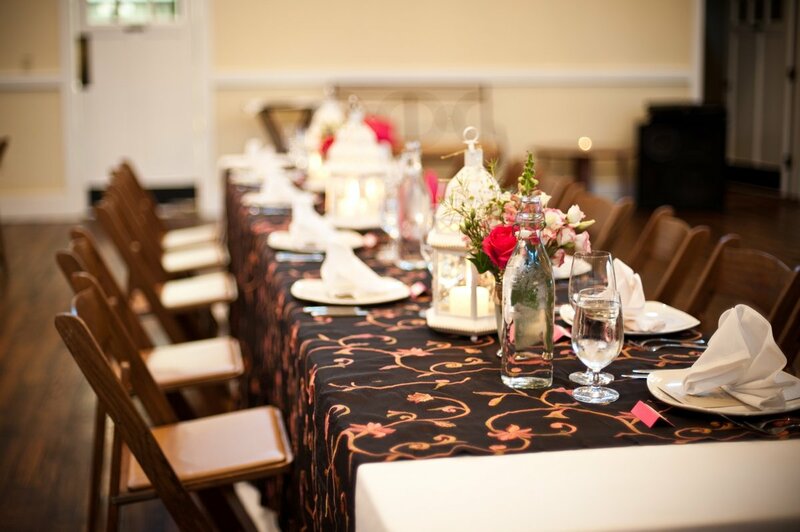 Equally important is the location and appearance of the chairs, their compatibility with the Banquet table. 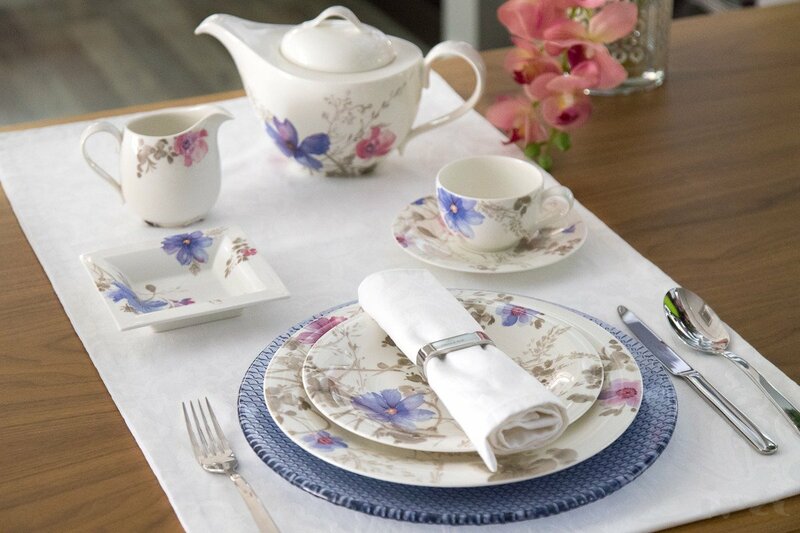 Smart setting allows for even the order of serving dishes. Consider the main points. 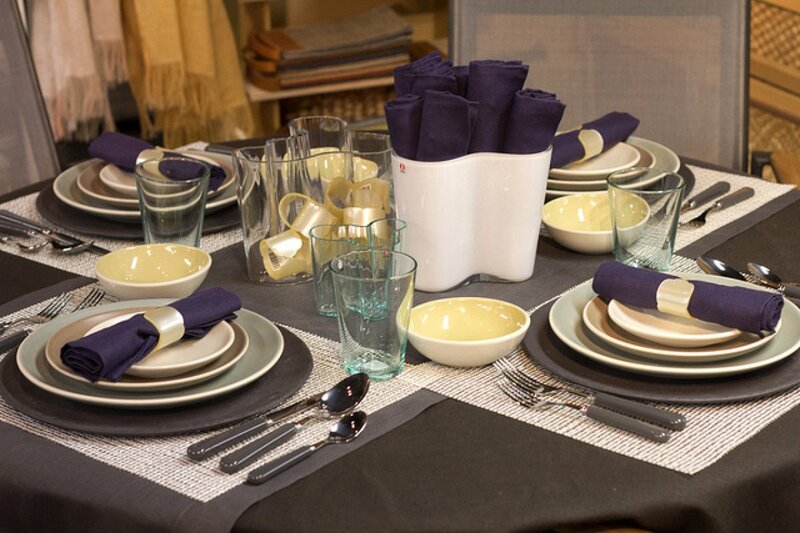 in shades of a certain color scheme – textiles and utensils should be combined with the overall design of the interior. in a certain style depending on the style orientation of the room. It is absurd to place on a deliberately rough wooden table fine porcelain partings with gold and lace edging. Equally out of place in a classic Rococo square plates for sushi or dishes with Khokhloma painting. No less important is the correct placement of chairs. Is recommended to maintain between them an interval from 50 cm to 80 cm. This distance is quite enough for comfortable accommodation of guests. 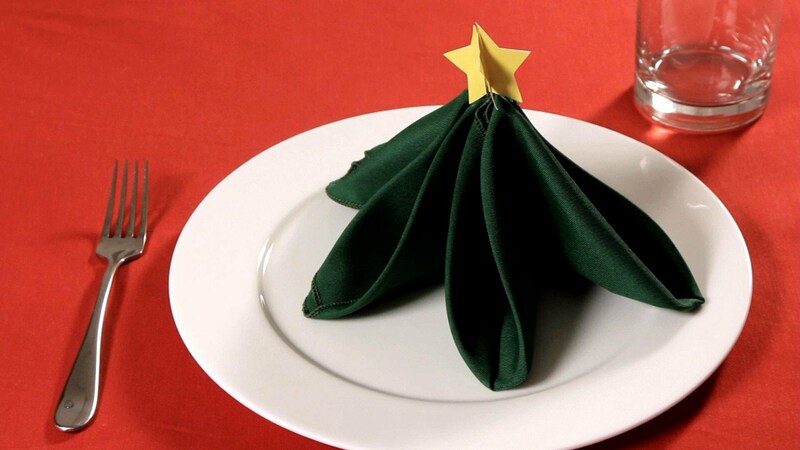 Cloth on the basis of a festive table setting. Oilskin and rubber coatings, as well as plastic utensils, no place at the reception. Not the best choice – products made of synthetic fabrics. They slide across the table, rumpled and look quite cheap. Quite another matter – natural textiles. 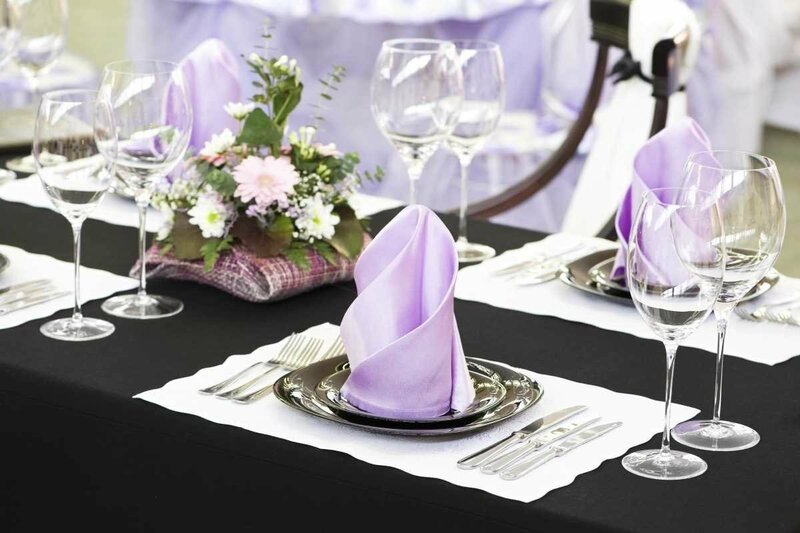 Solid tablecloths, linen, or crisp cotton with a satin weave give the event a special status and comfort. The table cover is better to do a dual layer underneath the main textile to spread extra fabric to match. 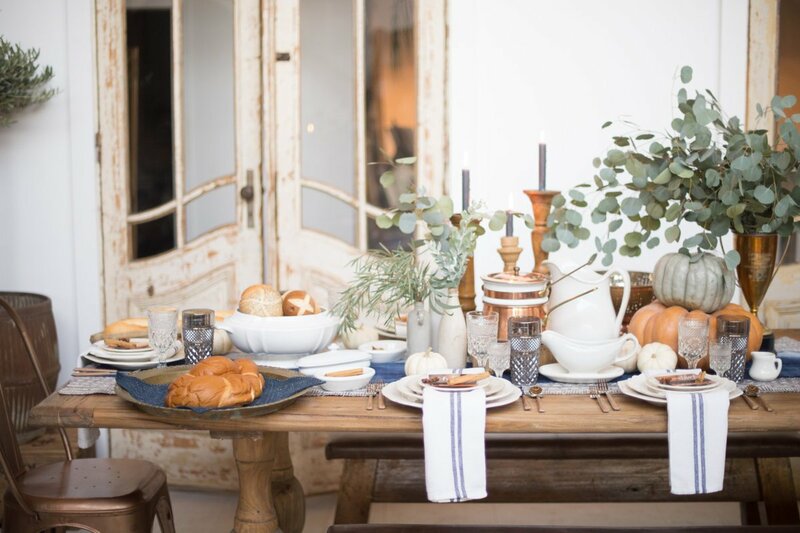 The color of the tablecloth can be any, but better to the table surface acted as a background for expressive and striking tableware and accessories. 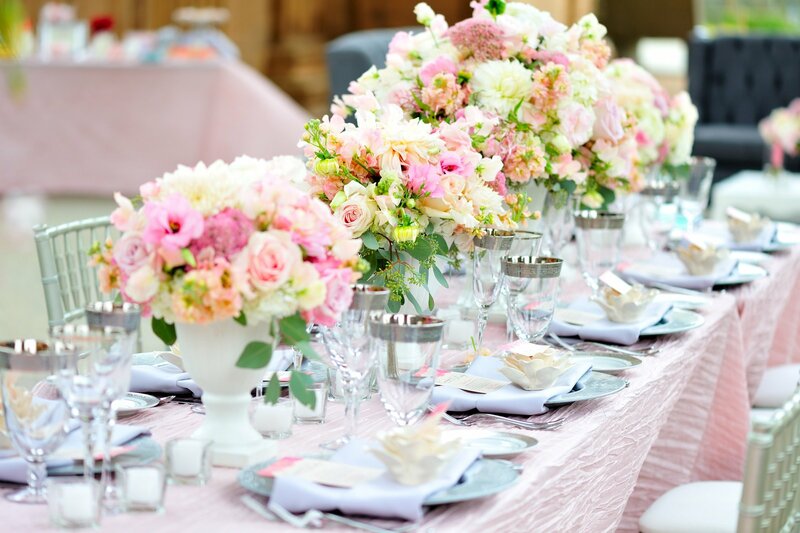 Therefore, the preferred light colors – pastel, pearl white, ash-pink, light beige, Tiffany. 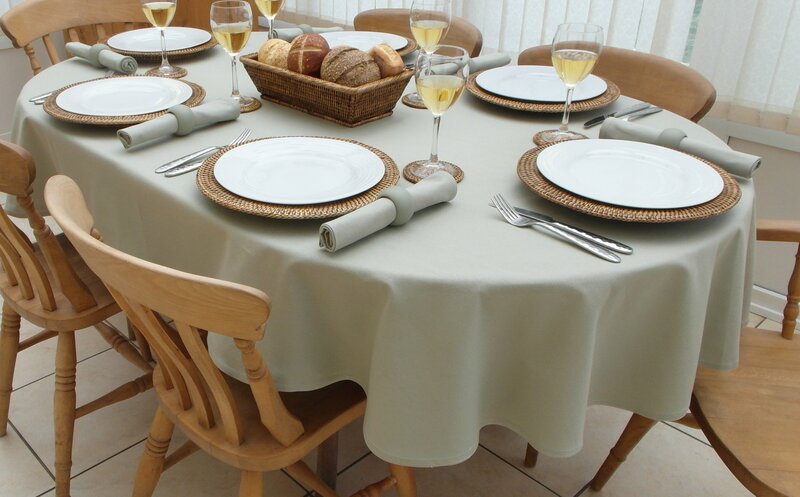 White, light grey or beige table cloth is universal. They are combined with any colourful flowers and leaves immense scope for your imagination. 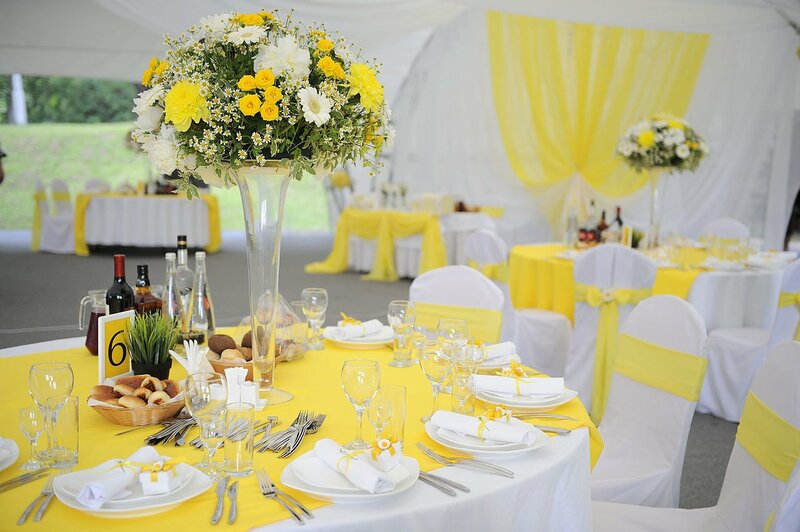 Its background will look great with bright accessories – flowers, napkins, glasses, draping, bows for chairs. At the birthday party of a young girl it will be pale pink accents, holiday Mature men – dark blue or Bordeaux. 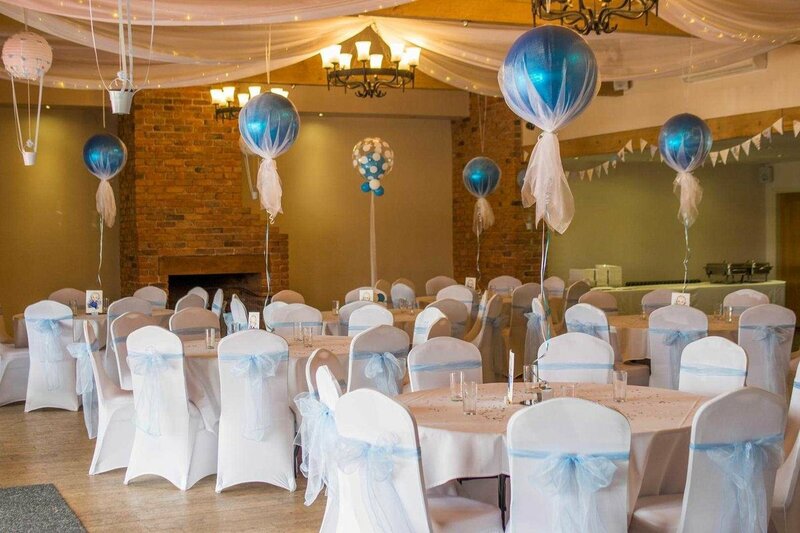 For a wedding celebration any bright colours – lilac, pink, turquoise, green. Plates for celebrations must be from the same set, otherwise the beauty of serving have to forget. They must fit the overall color design, the style of the room, the nature of the event and the selected cuisine – European, Japanese. If you intend entree – can’t do without deep soup of the devices. Under them as a stand at a distance of 2 cm from the edge have flat plates, which perform a protective and decorative function. The instruments follow each other during the change of dishes. 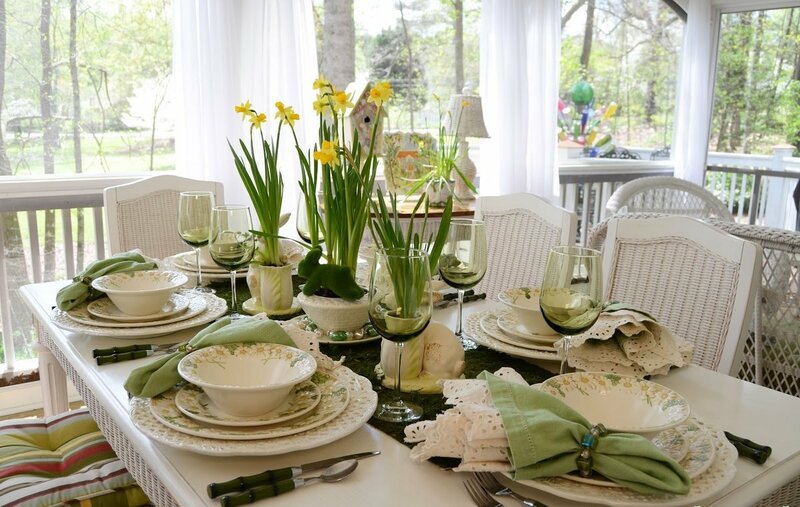 Instead of used dishes, guests receive clean and continue to eat. During lunch, might happen 3-4 shift plates. Believe that deal with Cutlery as difficult as the development of the Chinese letters? But, no! It’s very simple. Forks and knives are arranged on two sides of the dishes. Knives are always to the right. Their spearhead is directed to the plate. Here are placed a spoon for soup nose up. On the left side of the plate are the forks, the prongs of which are aimed at the ceiling. 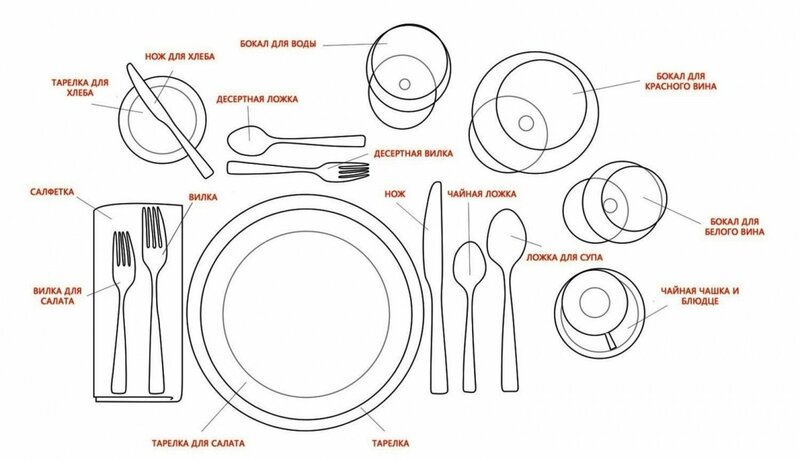 A little harder to understand the hierarchy of Cutlery to see how the dishes meet certain of their representatives. But this is us on the shoulder. The items are laid out so that during the meal to move from the edges to the plate. 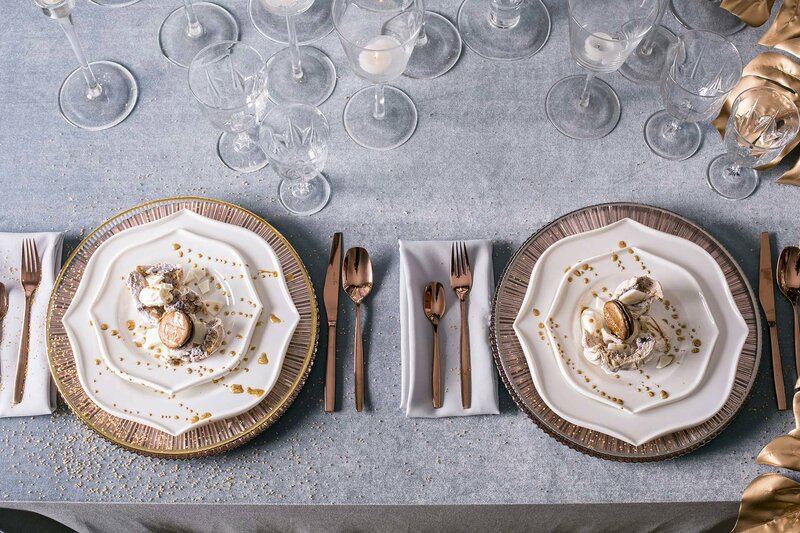 In the extreme rows, fork and knife for snacks, a little closer to the plate, the Cutlery for the main course and right over the plate – dessert accessories. Knife and spoon for desserts put in such a way that their pens looked to the right, the plug is exactly the opposite. Knives differ depending on the specific of the main dishes – those that are designed for eating fish, have a rounded tip. Butter knives are placed on a Pirozhkova saucer. Before talking about the proper placement of glasses, should specify that the drinks are replaced throughout the dinner several times. For each of them, there must be a separate vessel – glass for water, glasses for champagne, white and red wine, shot glasses for vodka, liqueur and cognac. Specialized vessels helps to reveal the aroma and taste of each drink. To place such an intense Arsenal on the table is not so simple. There is a certain rule – the glasses are set to the right of the guest at an angle of 45 degrees to the line of the edge of the countertop. Their location must match the order of change of drinks. The first – for the aperitif, use the most distant of glasses. Gradually used containers leave the celebration. A glass of water remains until the end of the party. The choice of colors depends on your taste and the nature of the event. Most importantly, all the elements should be combined with each other, it is advantageous to emphasize the brightness and set off the whiteness of each of them. Look perfect combination of color inks related tones. For example, sky blue support is turquoise and dark blue. 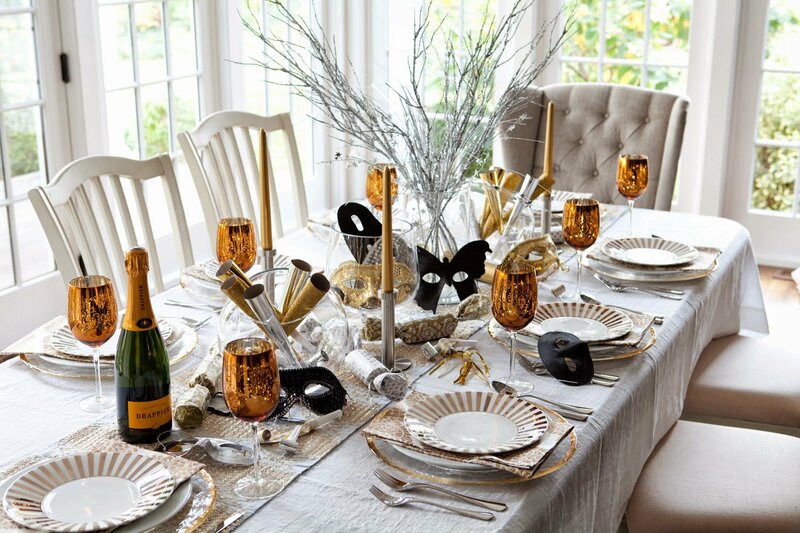 At any table appropriate gold, silver, crystal and pearl accents. 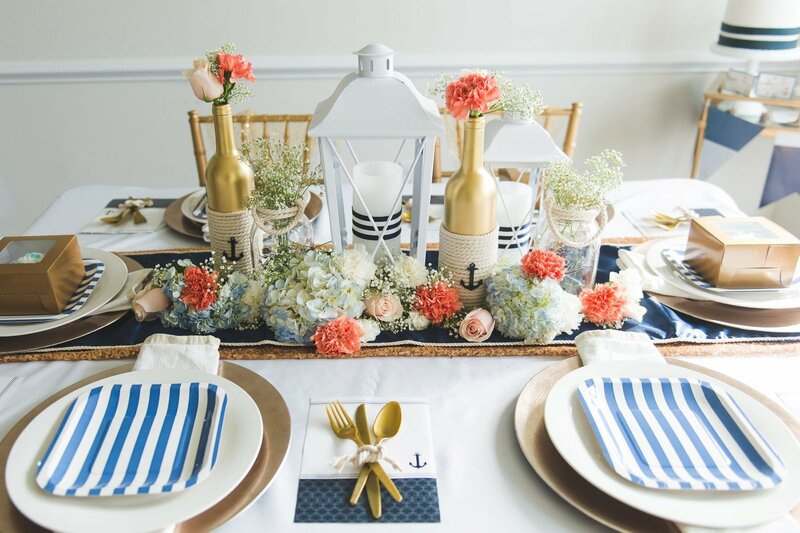 It is necessary to accent the shade was repeated in different accessories – napkins, floral garlands, ribbons for decorating Cutlery, cards with the places of the guests, the balloons, hung from the ceiling. This will help to unite the disparate elements together and to a harmonious whole image. One should not lose sight of that. After all, you want beautiful photos? The choice of style servings depends on the overall character of the interior, from its filling. In different countries there are national traditions and customs of serving that should be followed. Prefer rustic simplicity? Country style characterizes the naturalness rural flavor instead of the styling. Coarse ware, furniture, textiles from greige fabric with a simple print. As a rule, linen, flannel, cotton fabrics in plaid, polka dots, small flower, stripe. The selected shades of terracotta, grey, brown, beige. 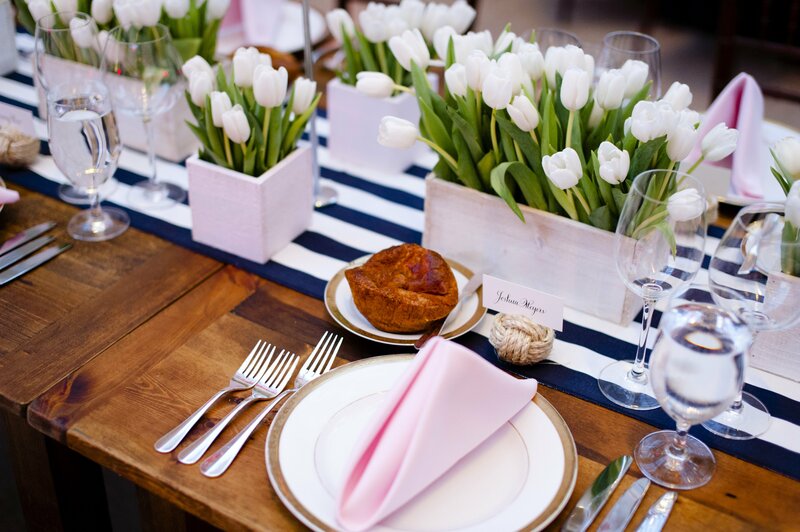 The table can be decorated with flower pots, a composition of twigs and twine. Transfer in a serving of autumn mood is very simple. 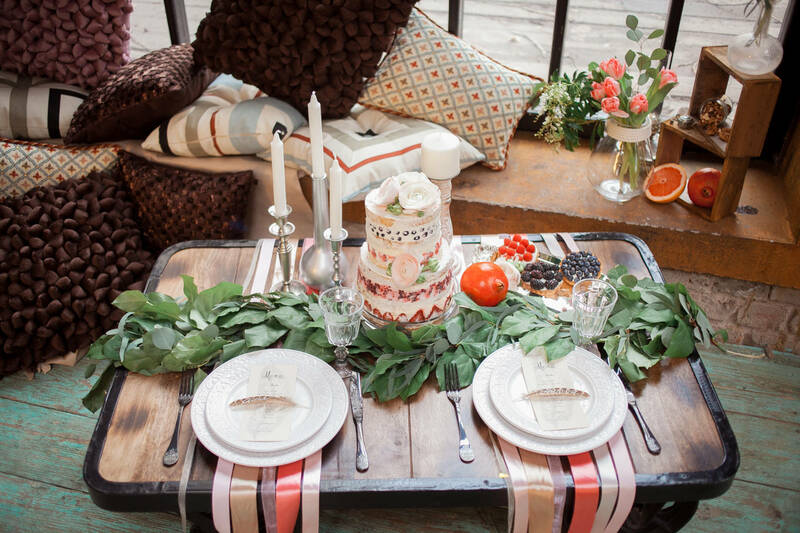 Just add some tan accents or lay a tablecloth with a print of autumn leaves. Decorate this table a beautiful autumn flowers – asters, chrysanthemums, gerberas. Not less expressive accent will become yellow and red bouquet of maple leaves or a small snopik of wheat ears. 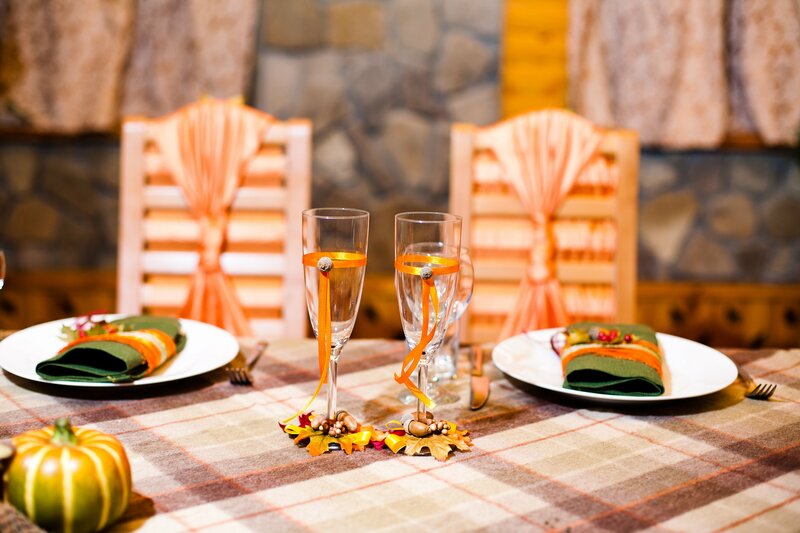 To maintain the natural theme natural materials – cones, tree branches, orange candles, napkins. 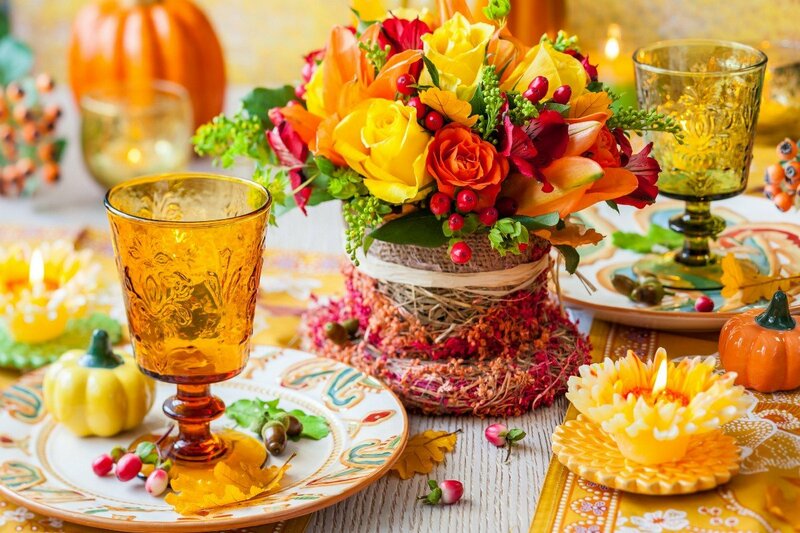 Autumn fruits and vegetables can also act as a decor – apples, small pumpkins, turnip, a bunch of onions and so on. One of the most attractive thematic styles. 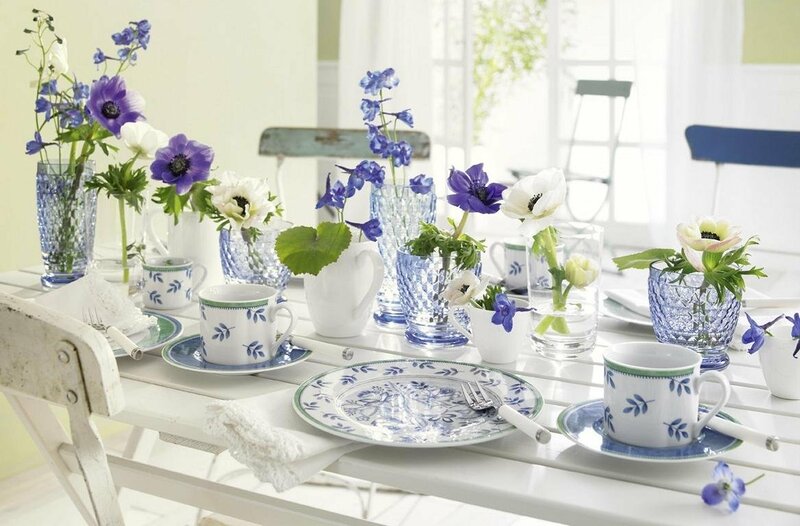 The main condition for proper marine serving – the selection of white and blue colors and sea patterns and accessories. 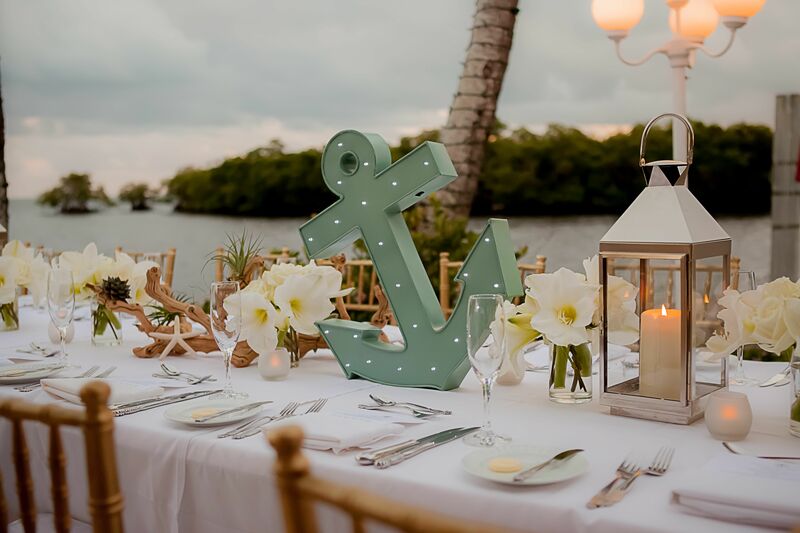 Embroidered anchor on white tablecloths, napkins or tablecloth in a blue and white striped crockery ornamented with starfish and fish, ship’s rope in the accessories indicate that in front of you decor in a nautical theme. 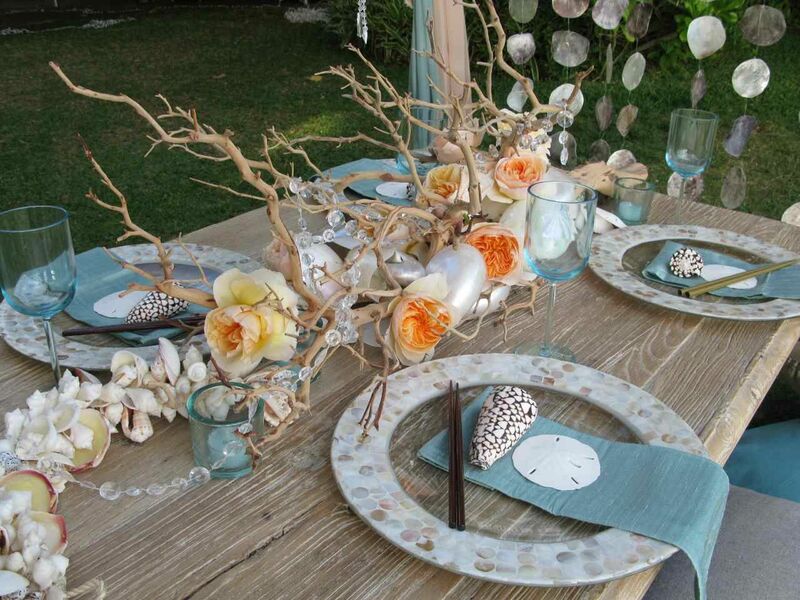 On the tablecloth can be placed transparent stones and shells, all the little things that emphasize the closeness to the sea. The popularity of the use of natural motives in serving increases from year to year. The main features of this style – natural soothing shades, natural wood and fabrics. Welcome – rattan wicker furniture, green plants and a huge amount of warm light. 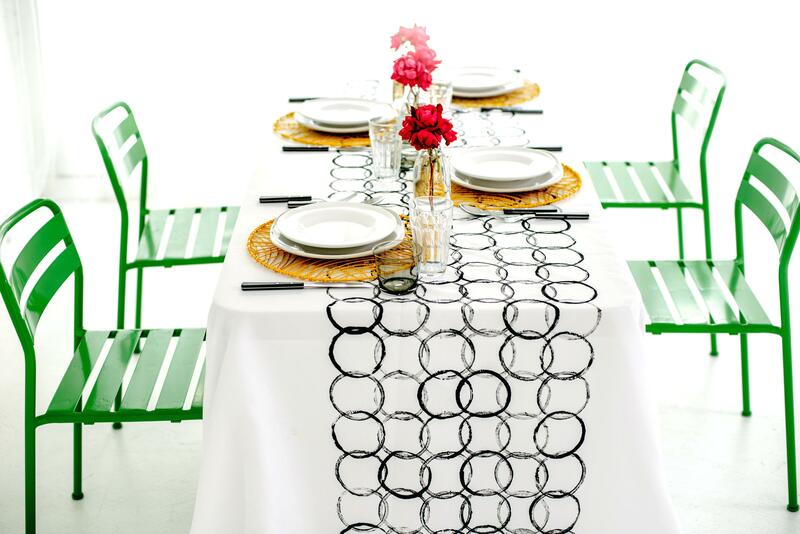 Cover the table with a tablecloth or not – only your choice. 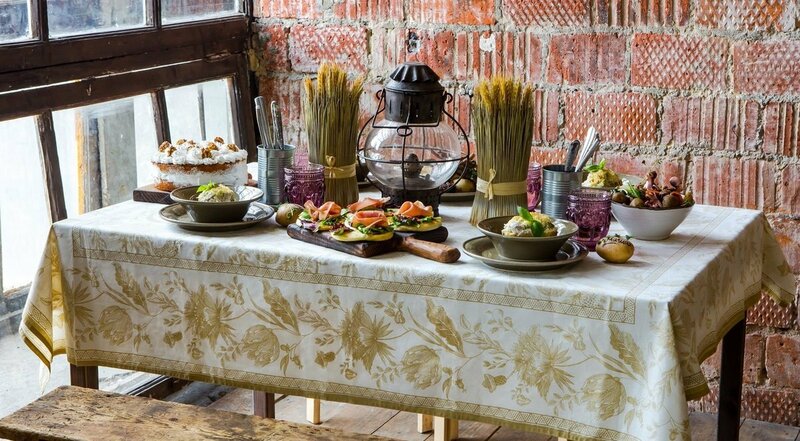 If you do decide to use a tablecloth, choose natural materials. Since the metal in the style of eco – friendly persona non grata, choose ceramic, wooden or glass container. It is preferable to use ceramics matte, as the gloss in this case is misplaced. Looks original cookware with uneven, as if the broken edges. For drinks use ceramic or glass jugs and glasses natural shades. The theme of eco is to support wooden baskets for fruit. 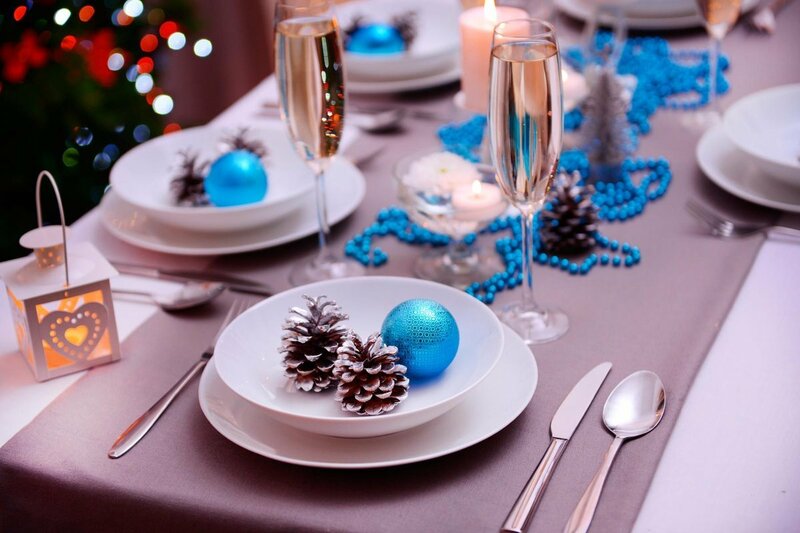 As a decoration of such a table often use a composition of natural moss, pine cones, nuts. 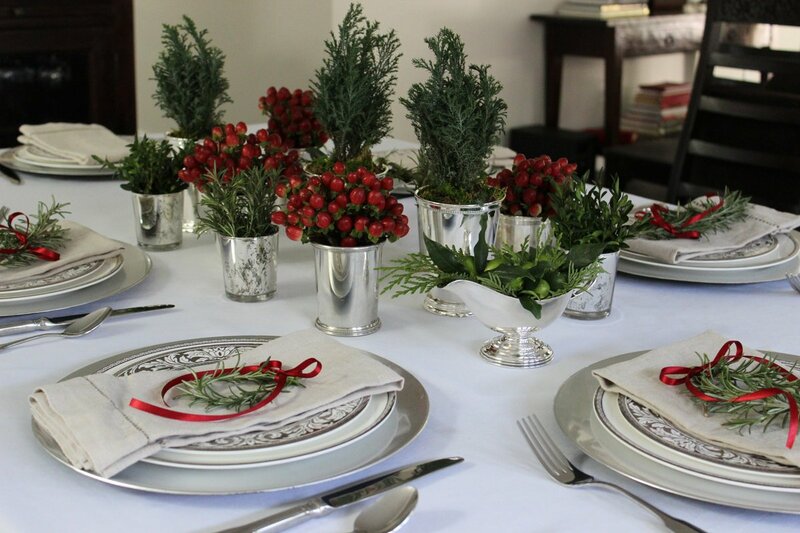 And if you have a windowsill of herbs, it is perfect for the holiday table decoration in eco style. Italian notes appear at the luxury kitchen decoration. Here reigns a gold and silver finish, vintage accessories. 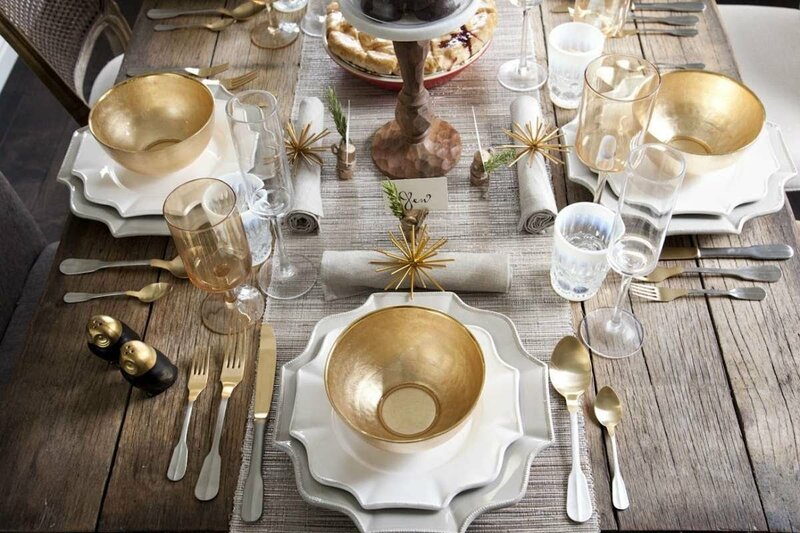 Gold and silver appears in the lining of plates, Cutlery, napkin rings and gravy boats. Crystal, gold and silver goblets will perfectly fit into the Italian style. 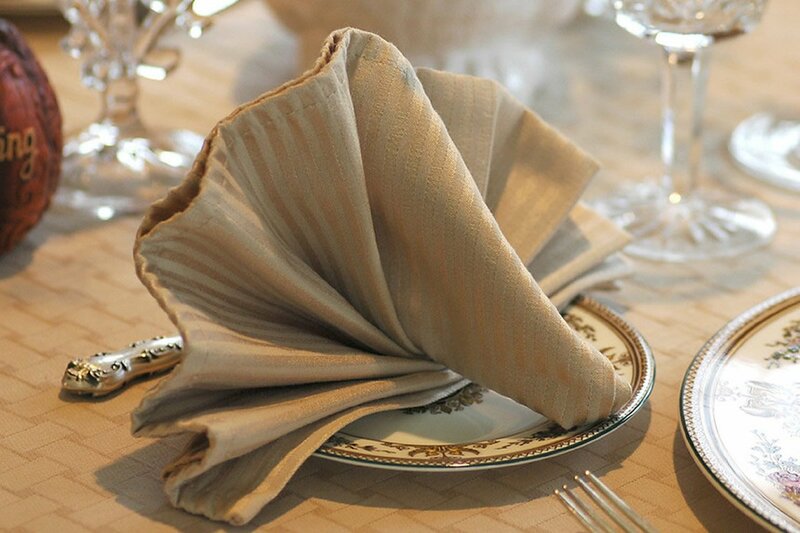 On formal occasions the napkin should be laid to the left of the guest. In a homely relaxed atmosphere, it can be placed in the plate. Ideally, the cloth should be white, well-ironed and efficiently. Allowed and the other plain cloth light neutral shades. If you want you can add blotches of eco-style in any interior. Recently, the popular party, referring us to our recent history. That is the interest or nostalgia? It is not clear. But the fact remains. 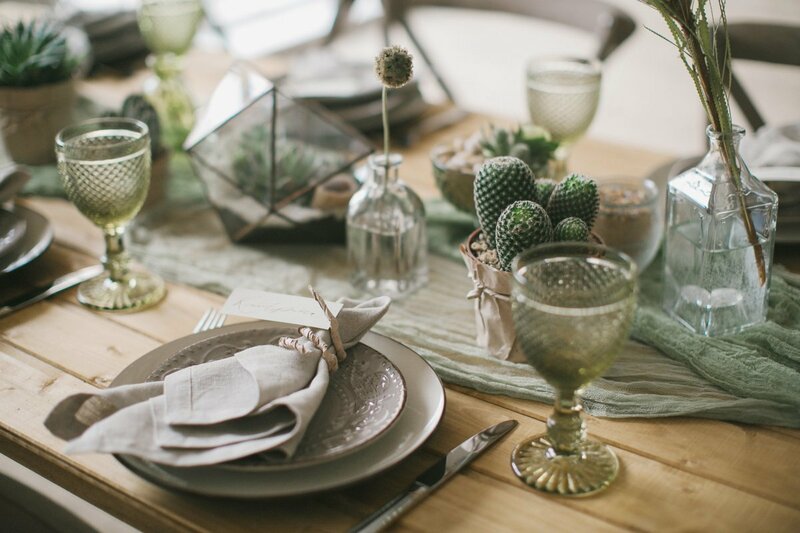 So how do you decorate a table in style these years? Food should not be gourmet – Olivier, herring, pickles, jellied meat, boiled potatoes, salad – the perfect choice for this party. Utensils allowed unsuited to the style of those years. If at home kept my grandmother’s old plates, glasses, wine glasses safely get them out of storage. 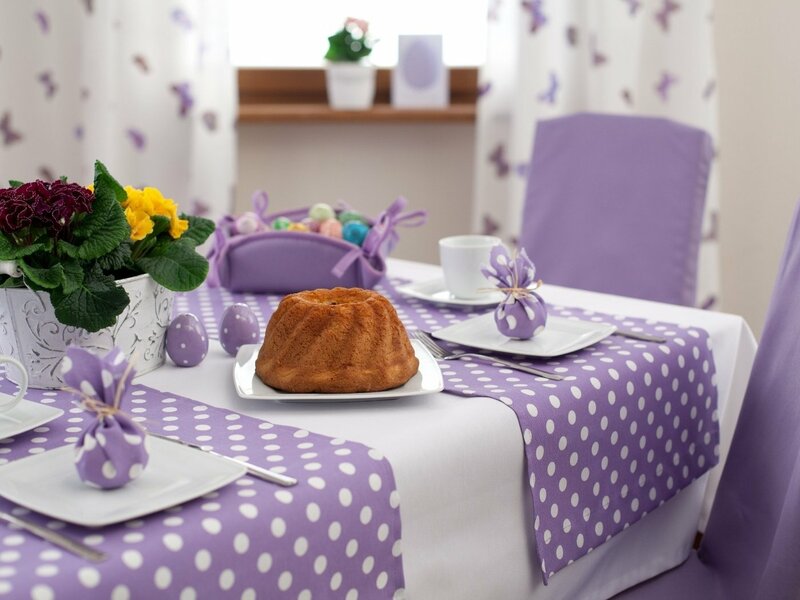 The tablecloth can be any, but most of our moms on the festive table just a new cloth, and sometimes the table was Pastilla Newspapers or even nothing. 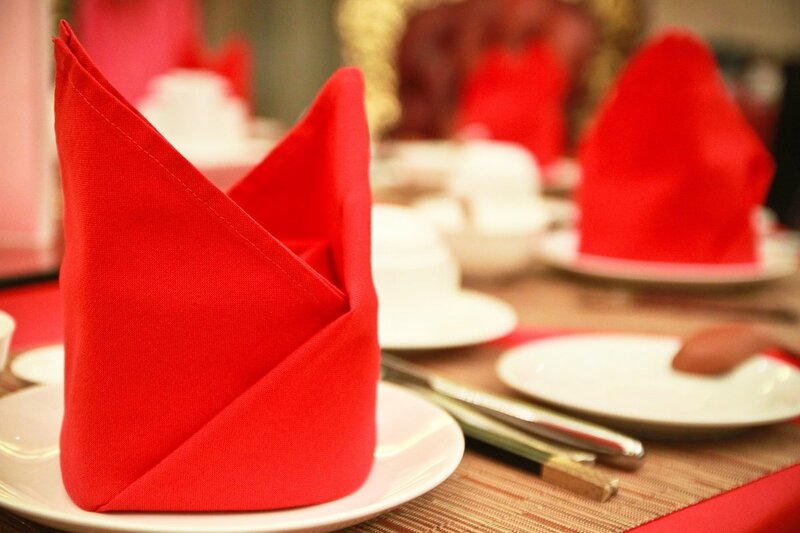 As accessories have performed plastic napkin holders with paper napkins. Special decorations were not. 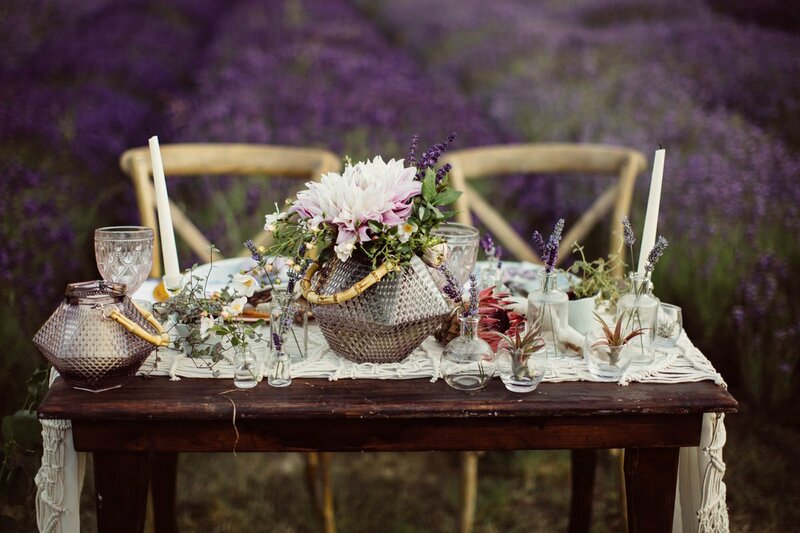 Association with the style of Provence send our imaginations in a French province, drowning in roses and lavender. Serene and happy rural life – something that should be tired from the stress and bustle of the eternal city dweller. 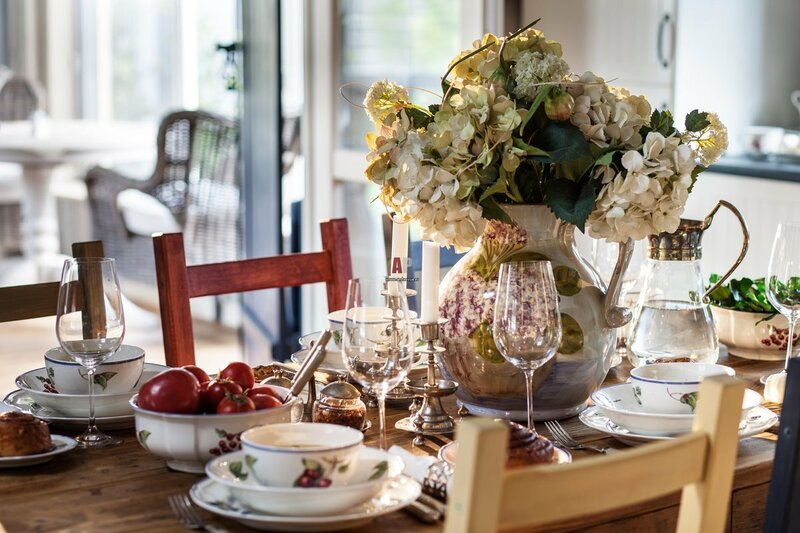 Delicious homemade food, excellent service – the easiest way to create the atmosphere of Provence at home. But we can not do without accessories and decoration that match this style. The highlight of serving can become a vintage accessories that the French are cleverly able to combine with an elegant, classic products. Color scheme – light. What tone should I use? Pearl white, silver, and also taupe. Prefer white dishes with raised edges, as if cut with his own hands. At the time appeal to antique silver Cutlery and napkins from my grandmother crochet. The tablecloth should be boil-and-white or gray-white. Accessories, covered with patina, crystal vases and glasses make chic. 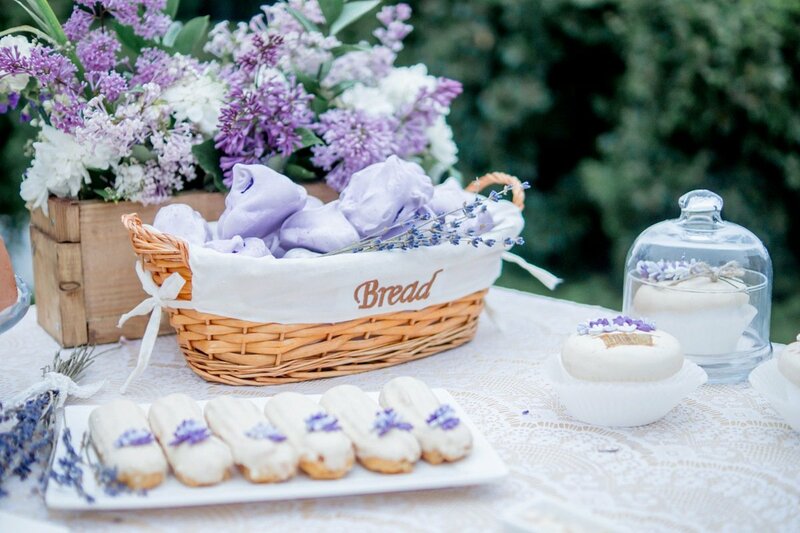 Most appropriate for serving in the style of Provence on the terrace or in the summer garden. 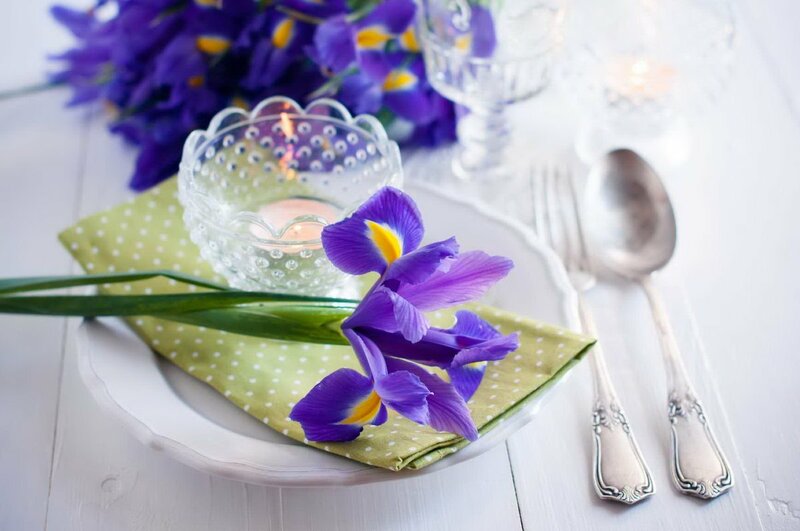 Decorate the table with a white cloth and dishes, add wrought iron chairs, self-grown flowers and enjoy the French atmosphere. Russian style has undergone significant changes and has virtually disappeared from the lives of modern Russians. 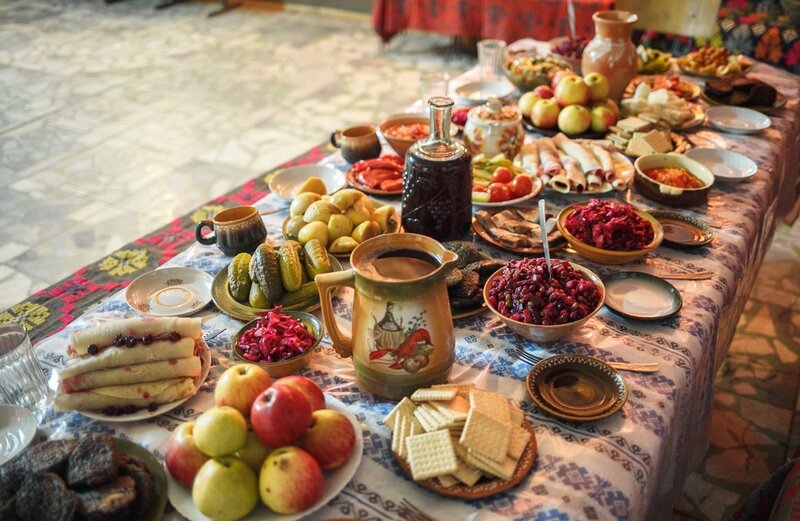 But during folk feasts actively use the products of Russian artists – pottery, wood – painted Khokhloma, Gzhel, Gorodets. On the table are deep and flat plates, ikornitsy, wooden cups and spoons. 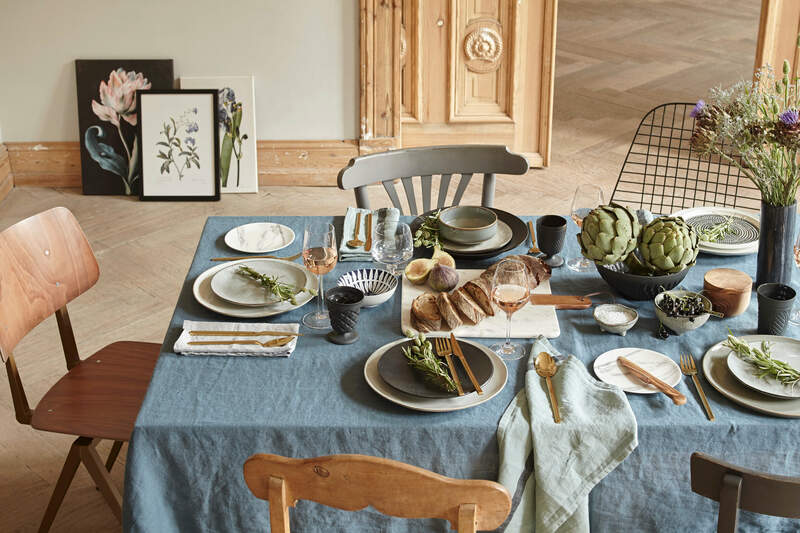 In ordinary life should be limited to small accents of antiquity, combining the modern dining furniture sets with elements, decorated with one or another painting – coasters, napkin holders, bread dishes. And, of course, the main decoration of any Russian table – a samovar. 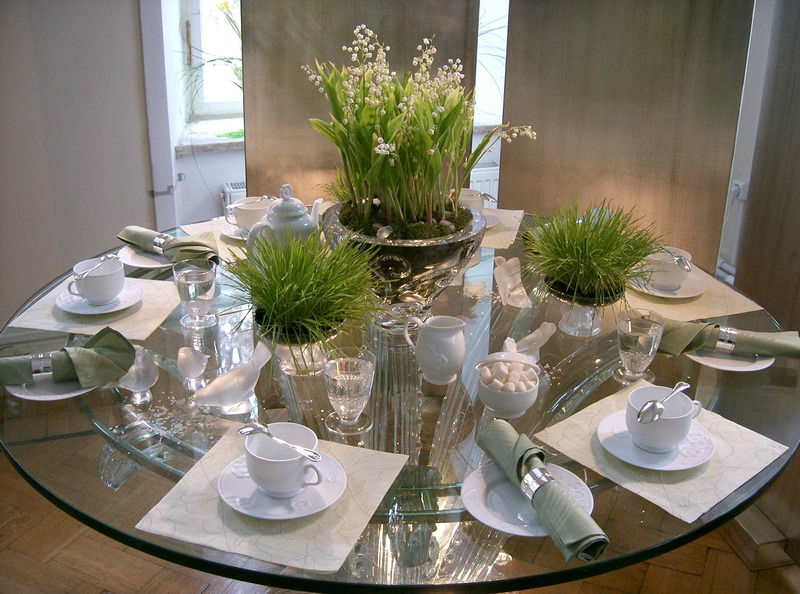 Table decoration in a Scandinavian style – a versatile option. The main features of this type of serving – the use of simple forms and lines and the predominance of natural materials and textures. It is appropriate accessories from untreated wood, for example, stands for plates, candle holders. Only natural textiles – linen, matting. This design is suitable for absolutely any occasion, but the peak of his popularity reaches to Christmas. 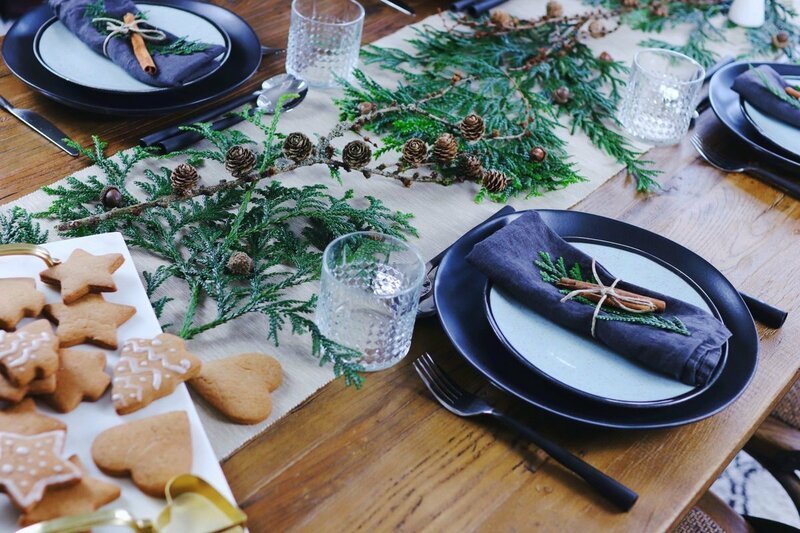 The fact that the middle of the table at the Scandinavian traditions must decorate a flower arrangement, supplemented with natural pine branches and cones, and on the tablecloth and napkins can be Norwegian patterns, which are executed in the form of snowflakes, trees, deer. Serving in Oriental style will make you feel like an Arab Princess who not only knows how great it is to dance and to cook. It is easily the sorceress is able to create stunning compositions from bright silks, precious tableware gold plated, pearls and sparkling gems. 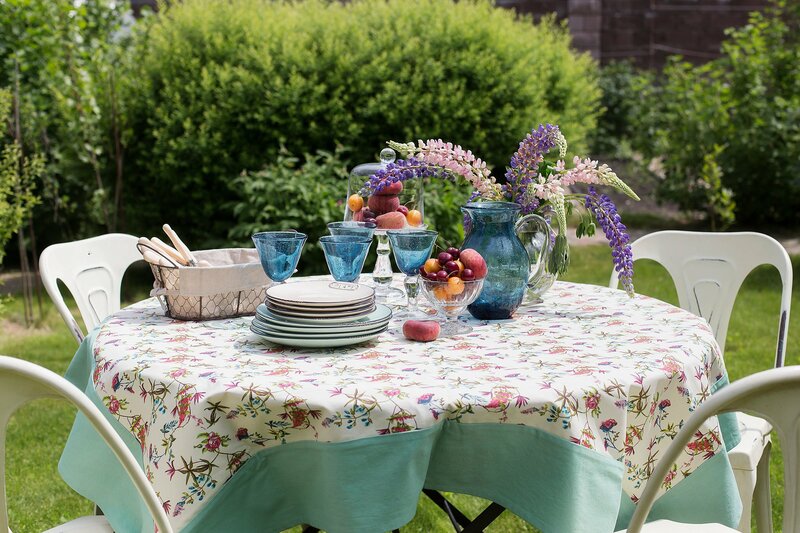 Bright shades and prints of national will make the design of your table is especially typical. This style is suitable for the occasion of Eid al-Adha. 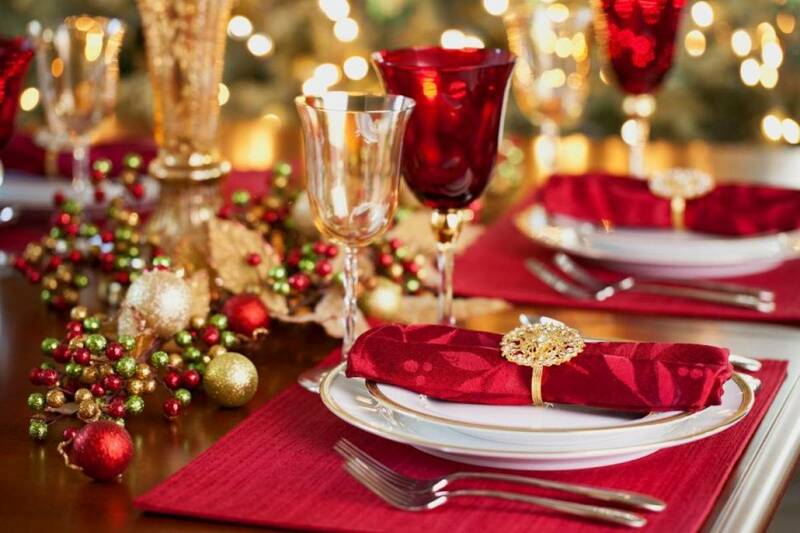 National restraint of the British left an imprint on such factors as the choice of style of clothing, interior decoration, choice of food and table setting. In England their traditions. One of them is an indispensable presence of a serving table. 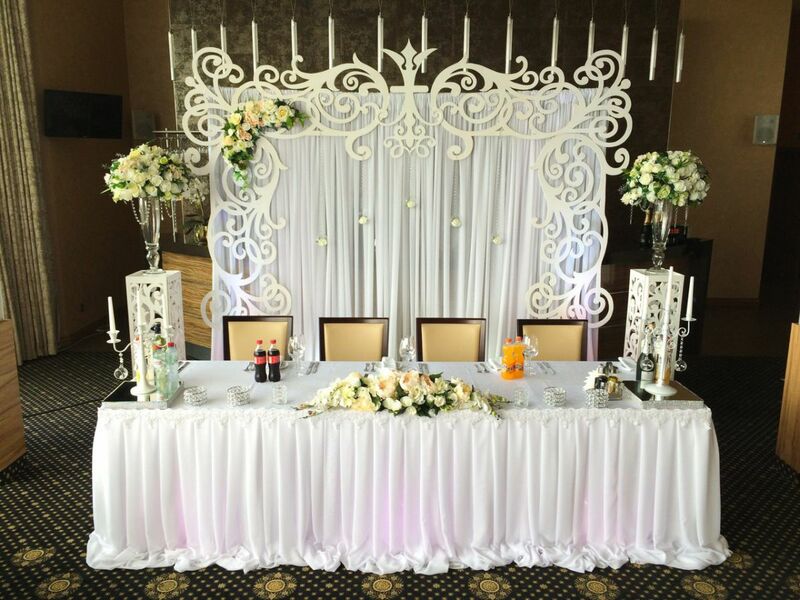 This is a useful structure, with different dishes placed next to the table. It is on the main table serves regular meals. Banquet table – small. 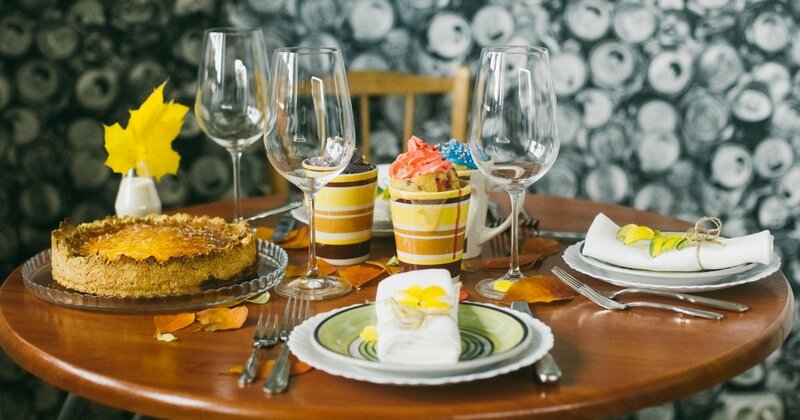 Before lunch or dinner there are only Cutlery, napkin, glasses, and dishes with snacks. Meals are served on the table one by one. Used plates promptly removed. For registration you must use good-quality natural materials. 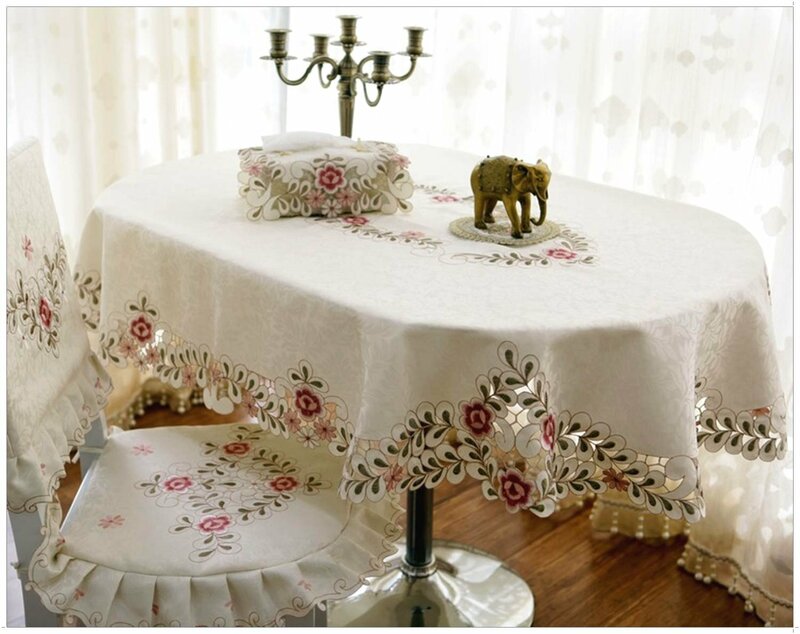 Tablecloth pattern, dinnerware with gold painted, crystal, flower decorations – indispensable attributes of such servings. Traditional English dinner, suggest the presence of two waiters. One of them lays out the food on a heated plate, and the second carries the guests. For English covers the following typical placement of food on the plate: hot main dish – meat or fish is placed in the center of the composition. On either side of him a side dish. Next is the sauce, it takes place over the garnish, and the bottom put fresh greens. For typical loft the idea of creating the atmosphere of an abandoned shop in an old factory – residential workshop without finishing. Interior elements appear here as if by accident. In this loft were often the objects brought from the dump or bought at a flea market. In the same space adjacent to the rough bench nailed together in haste, can be pretentious antique chair, antique statues. Serving should maintain this direction. There may be combinations of old devices and modern shiny elements of industrial origin. 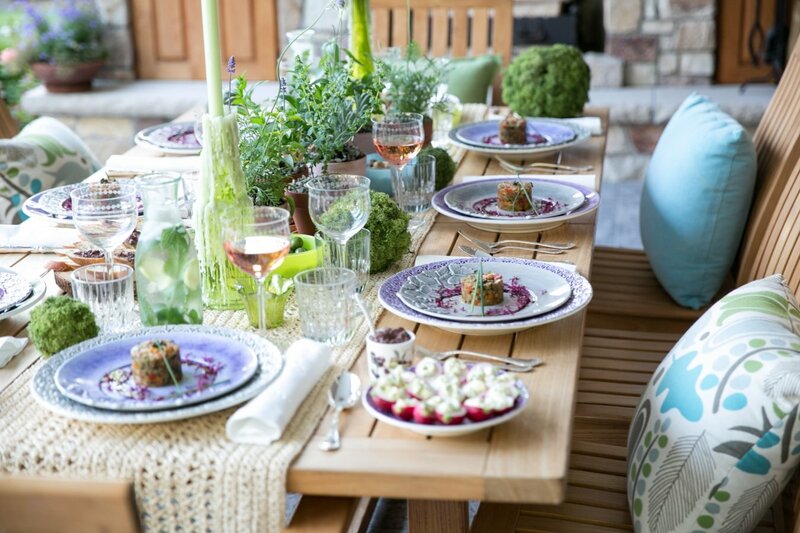 Table of raw wood material is combined with actual glass set of dishes. Tablecloths at such furniture is unacceptable, they will replace the napkin with abstract images. 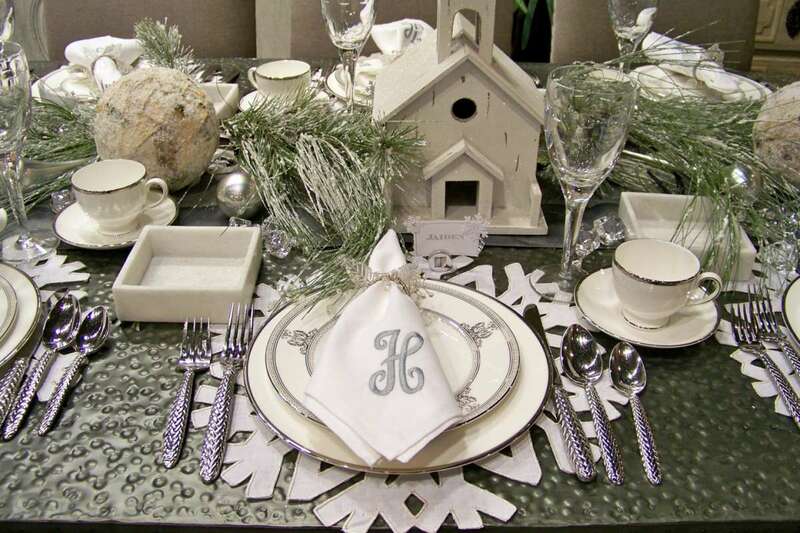 Accessories for the festive table will give the celebration a special flair that will make it unforgettable. But try to use them in moderation – abundance of décor can prevent conveniently and properly arrange the dishes, put devices. 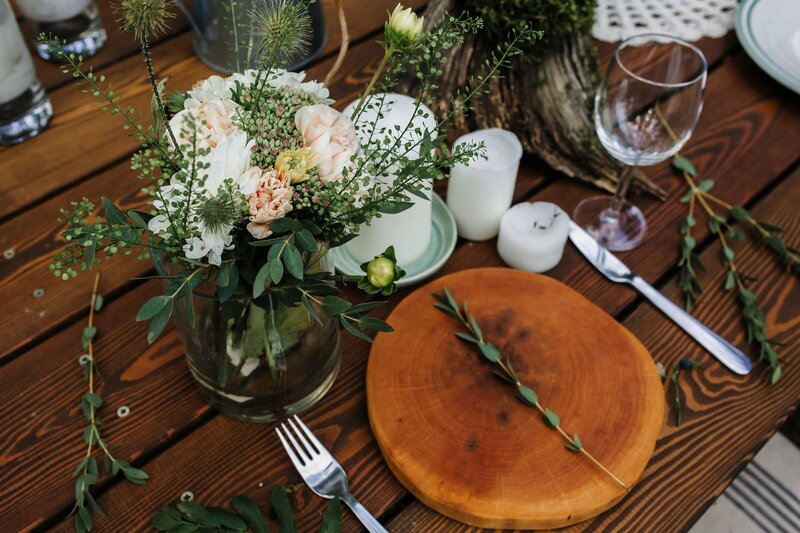 Options for decorating the holiday table flowers – set. This is the usual bouquets in all kinds of baskets, and the cute little flowers in separate vases, and the individual flowers in glass cups, and a Grand composition. 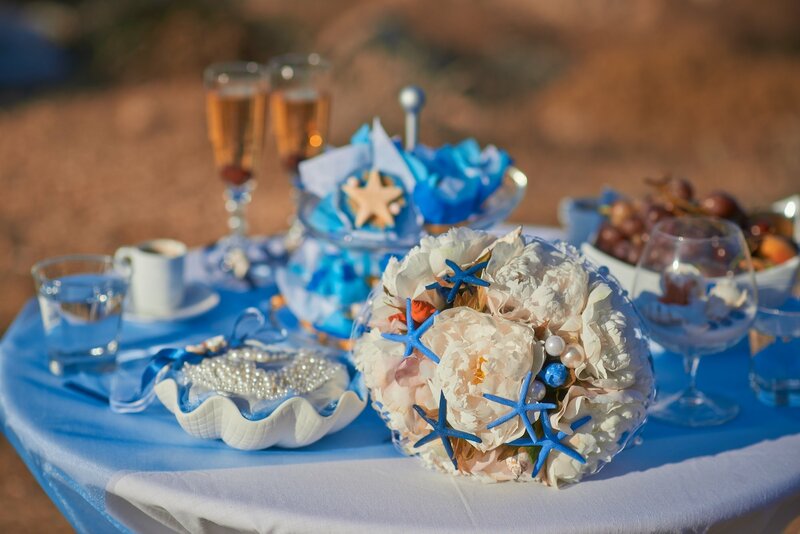 At the wedding table there are often garlands of roses intertwined with ribbons and beads. Look great separate the buds, placed in a vase of water. 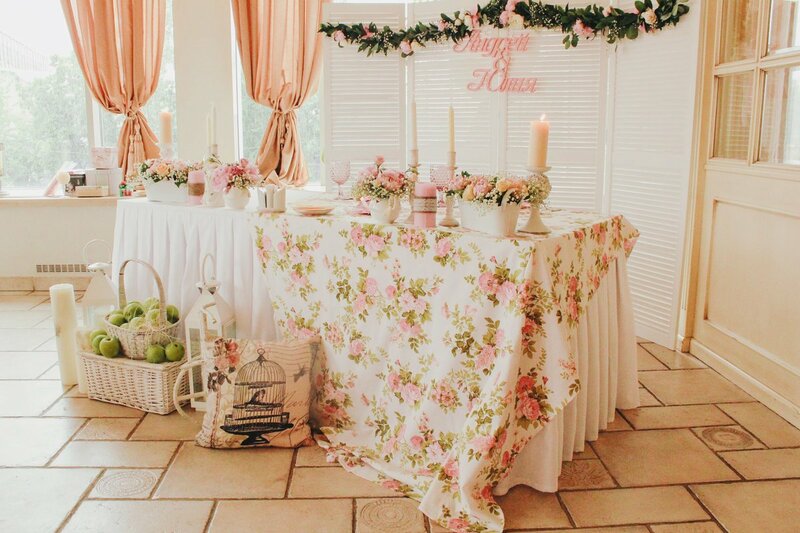 Rose petals scattered on the tablecloth, create a romantic mood. 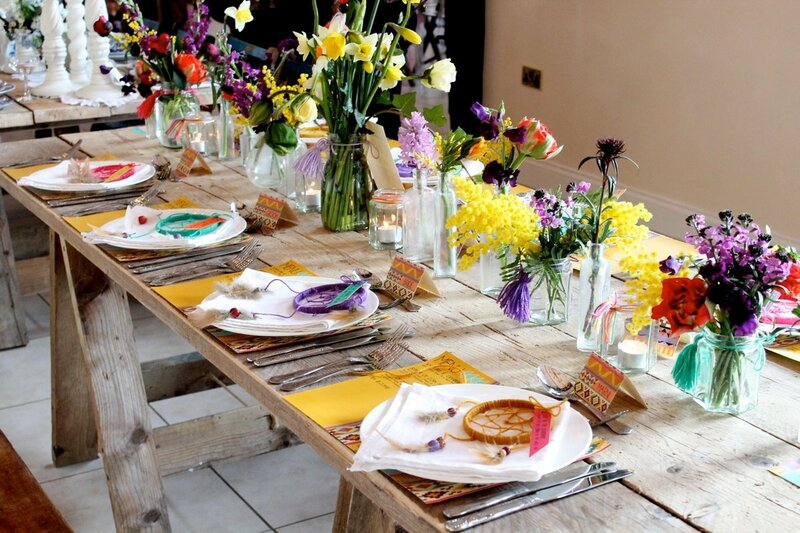 You can put flowers in a long track along the Central line of the entire table. 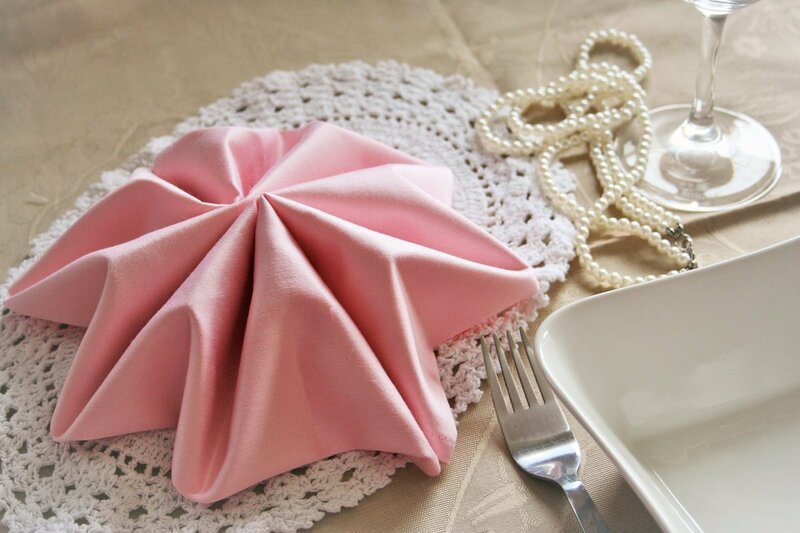 Looks adorable arrangement of twisted napkin, encased in a ring when it is added delicate little rose. Vases for flowers is better to choose low. They will not cover guests from each other and hinder conversation. The alternative would be to pot on a long thin and preferably transparent leg. Flowers in this case are located above eye level and do not close the review, and the thin leg is almost imperceptible. 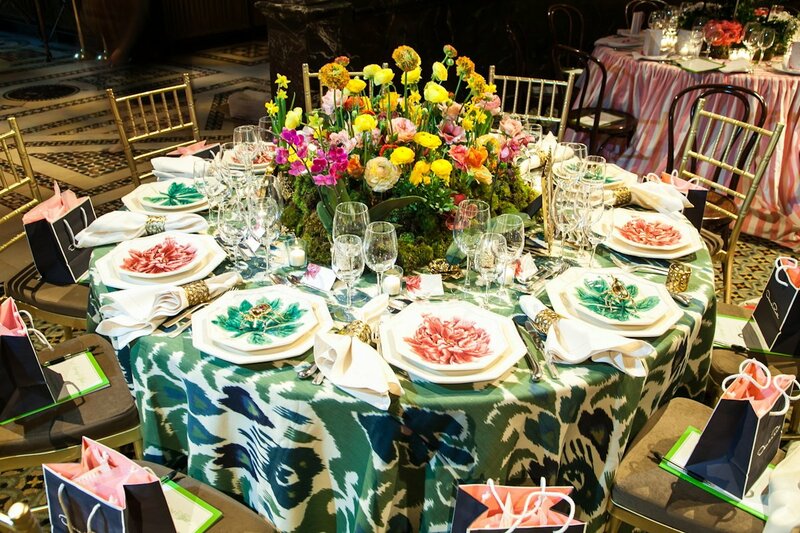 A variety of table flower arrangements for an event must be made in the same style and colors as all other floral decorations. For example, at a wedding party, they resonate with the garlands on walls, cars, flowers in floor vases, and even with the bride’s bouquet. 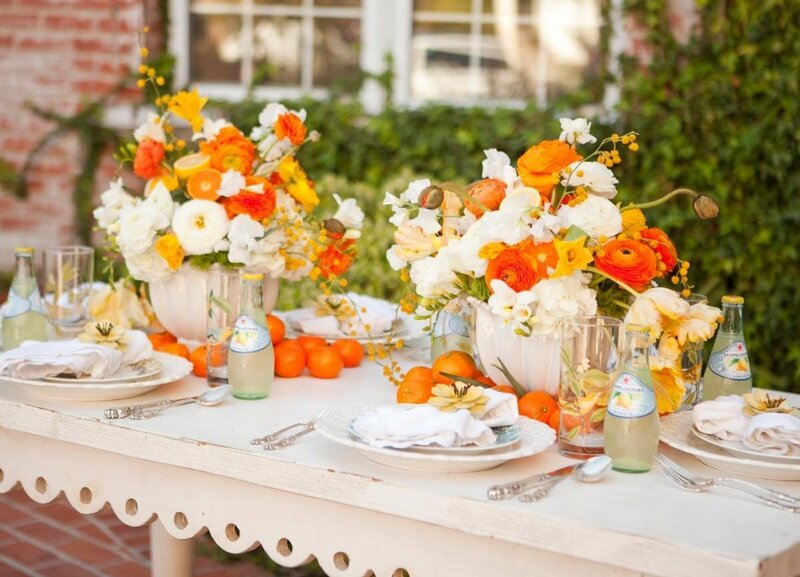 A table decorated with balloons, immediately creates a festive, happy mood. Brightly colored bunches, floating in the air – the dream of every child. This ornament has a dual function – helps to create a beautiful bright interior and amuse guests with interesting games and surprises. For example, you can put balls inside the tips with the tasks, completing which the player gets a prize. Or pour into a ball of shiny confetti at the right moment to stun everyone present, sprinkled them with rain of glitter. Variants of fastening of the balls over the table set. Bind them to the bouquets, colored stones, small balls can be put simply on the surface. An interesting option is to tie a ribbon on the ball of twisted cloth. 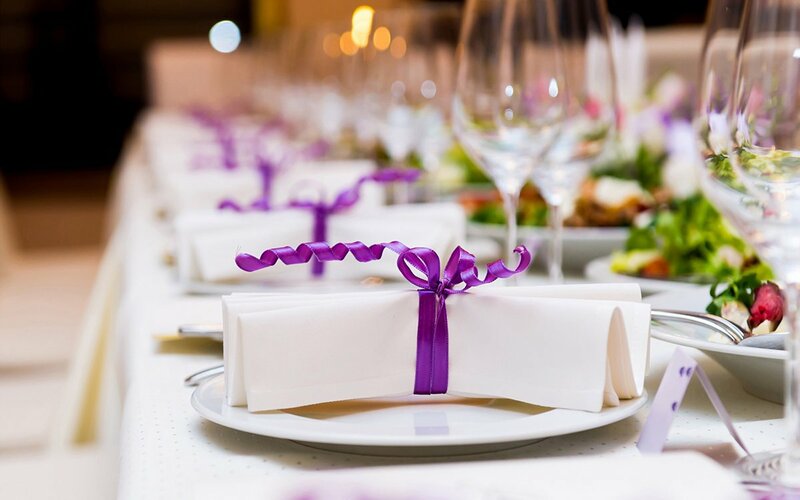 In that moment, when the guest wants to take a napkin, he will have to untie the ribbon. Ball like magic immediately fly to the ceiling. It looks fascinating. Do not think that this decoration is appropriate only at a children’s event. Balls of solid colors, made in muted neutral tones, look very expensive and totally adult. Neat rows of beige, black, silver jewelry look very elegant and stylish. 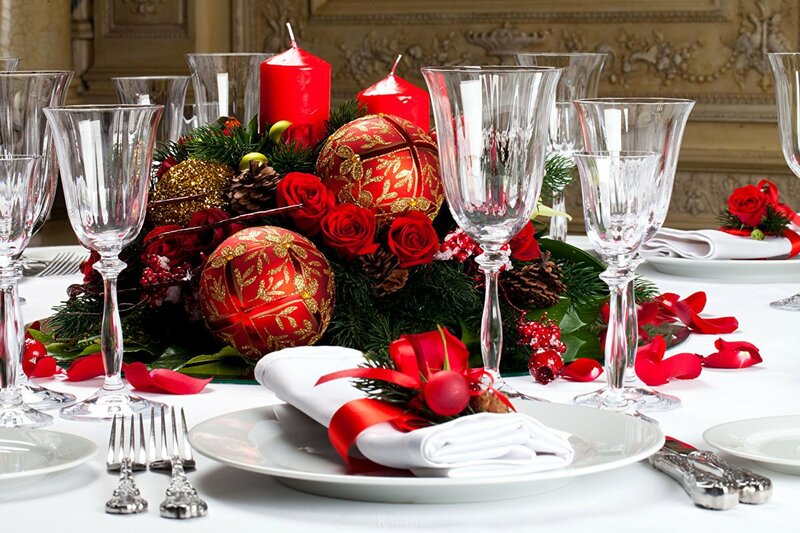 Candles – an indispensable attribute of the English dinner party, Christmas table romantic table setting. There is a huge variety of these products, so for every occasion there are certainly “those” candles. 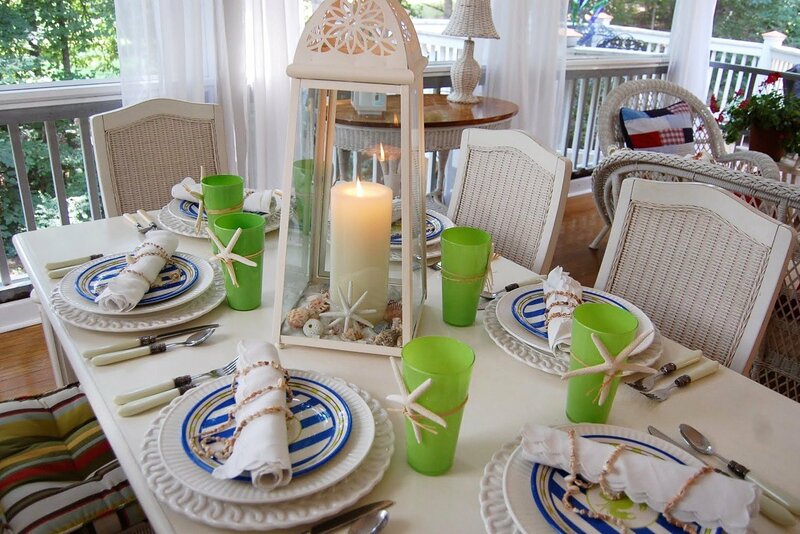 The style of candles and candleholders must comply with the General decoration of the table and the room. In a classical setting would be appropriate long candles in wrought gilded lamps. Industrial style is more suitable for chrome plated or brass candlesticks. In Provence will be a good white vintage jewelry covered with patina. 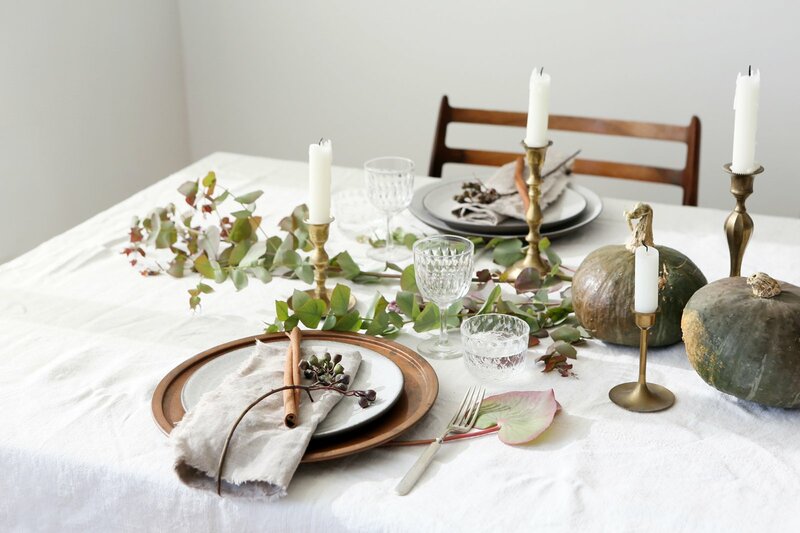 Scandinavian style decorate the candelabra with stand in the form of raw branches or deer antlers. Very cute product, “dressed” in knitted “clothes” – like covers for mugs. 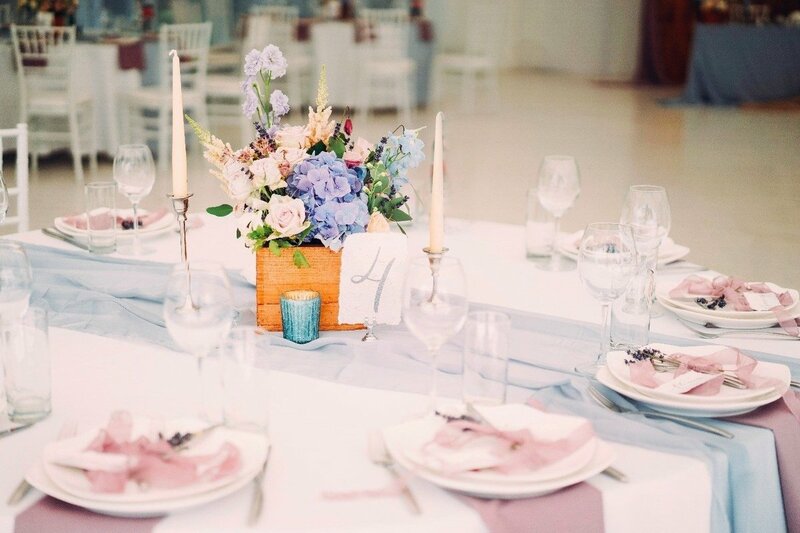 The color of the candlesticks and candles should support the main palette of the room or be neutral. Variants of arrangement of this decor set. 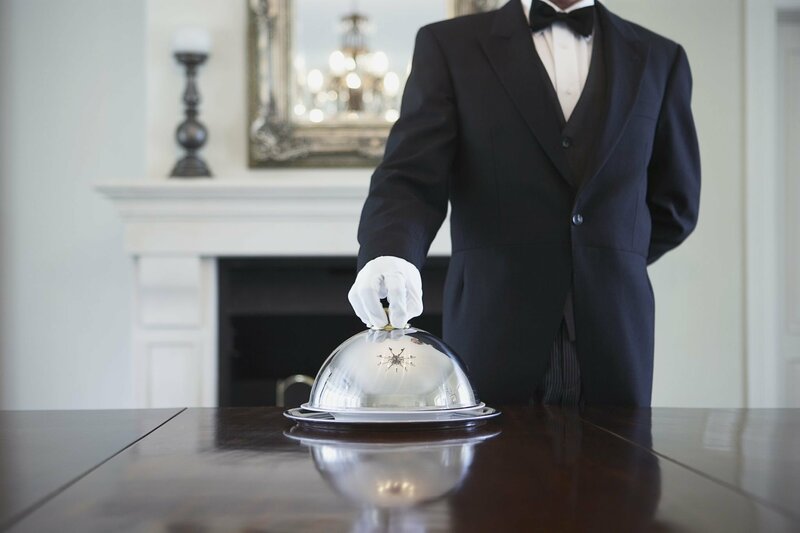 The main rule – they must not disturb the guests. Often candlesticks make up the whole composition with flowers, pine branches and even fruit. The imagination of designers knows no limit. swans – no comment here. Even a child would guess that it was my wedding song! There just are no ways of folding! In the form of candles, stars, fans, bow-tie, men’s ties, shirts, crowns, and even Bunny. For each event you can choose the decoration that will perfectly match the occasion, style, and color palette of the rest of the decoration. 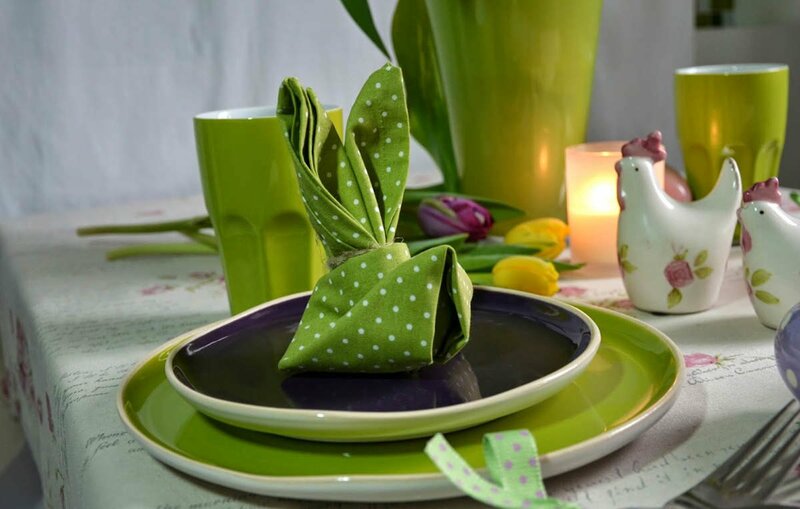 Amazing beautiful accessories can be made of conventional paper napkins. The growing popularity of styles, brings us closer to nature, not accidental. 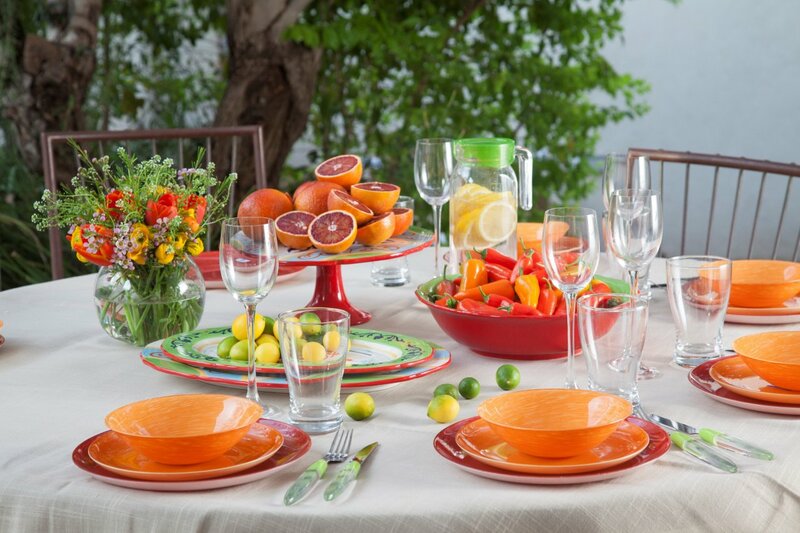 Bright colors and modern practical materials are easily entered our lives. And there is nothing strange. But time is running out and many are tired of the saturated colors, a dream to walk barefoot on the wooden floor and smell of fresh wood. The desire to return to a more natural colour and texture, is not surprising. Natural colors pleasing to the eye, natural materials filled with freshness, warmth and comfort. That is why there are so many followers of eco-style, Nordic, village. They may be present not only furniture, but dishes, vases for flowers, stands for plates, candlesticks and the different decor. In creating the composition involved logs, branches of various lengths and thicknesses, flowers, bamboo, natural moss, pine cones, pine needles, driftwood unthinkable shapes, natural stones. Very nice look bleached smooth sticks and polished driftwood. Utensils made of such materials is a wooden vessel of various bizarre shapes. Each of them is unique in its natural beauty. The Banquet involves creating a multi-varied menu. It must include appetizers, first and second courses, dessert. 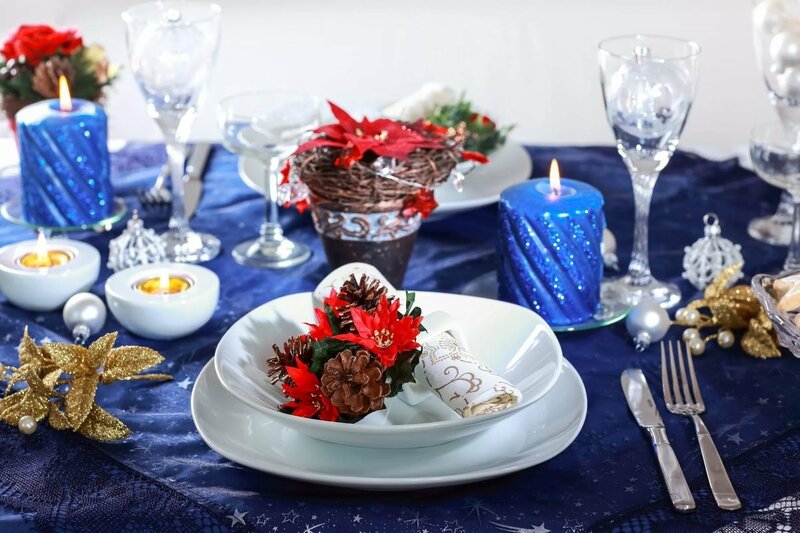 Festive table setting abhors the banal unfolding food on plates. In each dish should be the highlight, able to surprise and please guests. Therefore, such a popular decorating dishes. There are different ways of serving dishes. Let’s consider them in more detail. 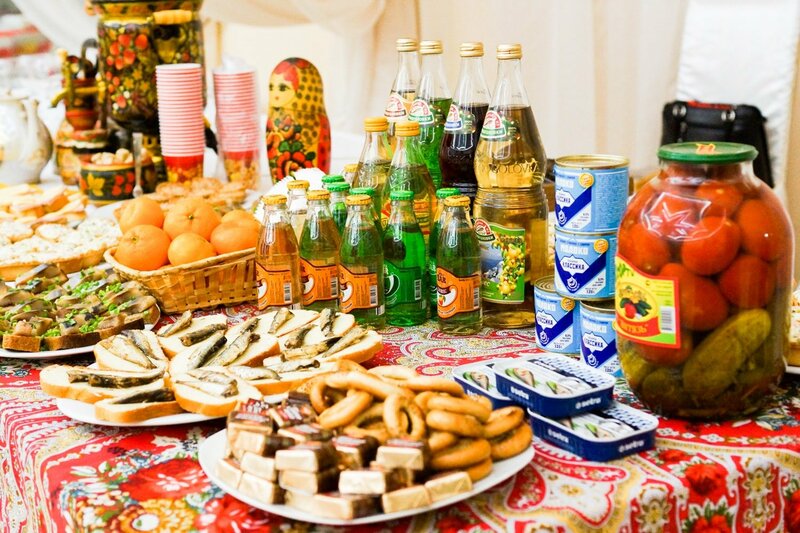 Russian way – snacks are on the table in portion dishes – glasses or dessert bowls, either in a communal bowl. 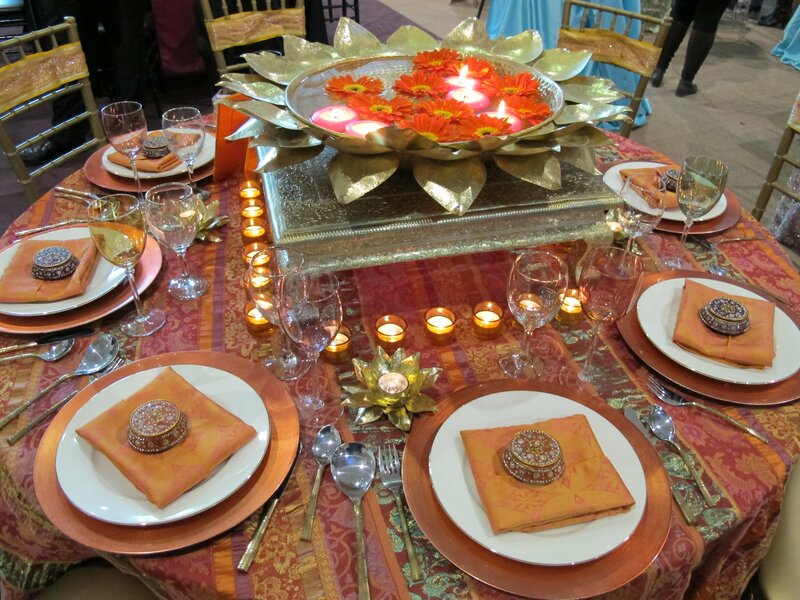 The table is prepared so that each guest had a separate plate for shifting the snacks. Hot meals are available in portions on individual plates. 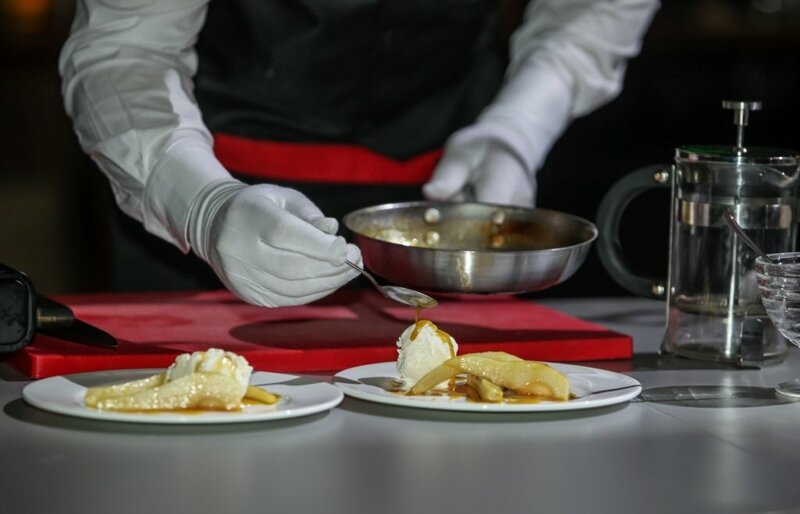 Pies are cut into the common dish and passed on plates using special Cutlery. French – in this method, the dish does not, and bring them alternately and put on the plate of the client separate portions. Empty plates removed at each change of dishes. 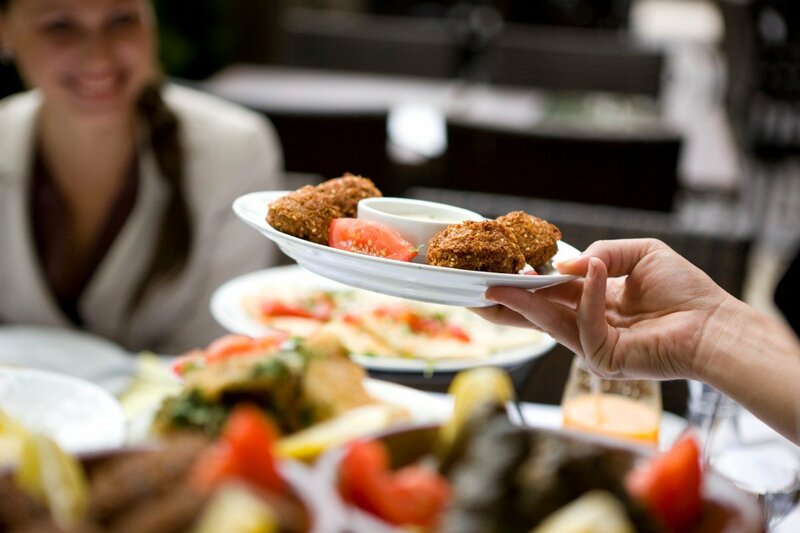 English is a filling dish customer, the waiter produces in the eyes of the customer for an additional mobile table. Here he also mixes and decorates the salads. Many holidays involve the presence of certain ideas and attributes. Options such countless celebrations – from Halloween to Ramadan. And, without a doubt, this should be reflected in the design of the table. Consider some of the theme options serving. 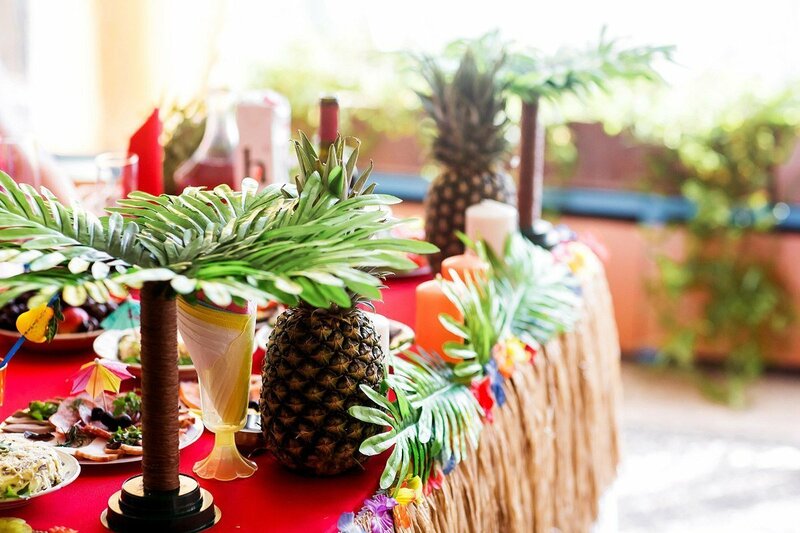 The luau involves the availability of exotic fruits and bright colors. Turquoise tablecloth and napkins can cause of the Hawaiian greeting “ALOHA” and then no one will doubt the theme of this event. 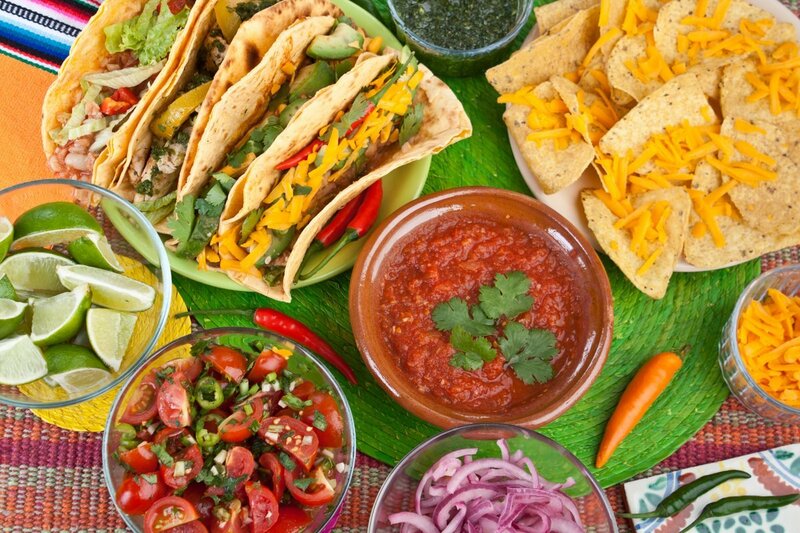 Mexican birthday – suggests a riot of colors, a complete lack of tablecloths, the use of bright or plain plates decorated with multi-national ornament, braided coasters tableware, textile, with contrasting stripes and arrangement of flowers and cacti on the tables. As decoration you can use mini-maracas – Spanish national instrument. Meals can be decorated with a sharp peppercorns. Glasses must be equipped with straws for cocktails. Black and white style is the complete opposite of the previous one. It is created using only black and white details. Full monochrome can mitigate only live plants. Include the third color should be very careful and measured. 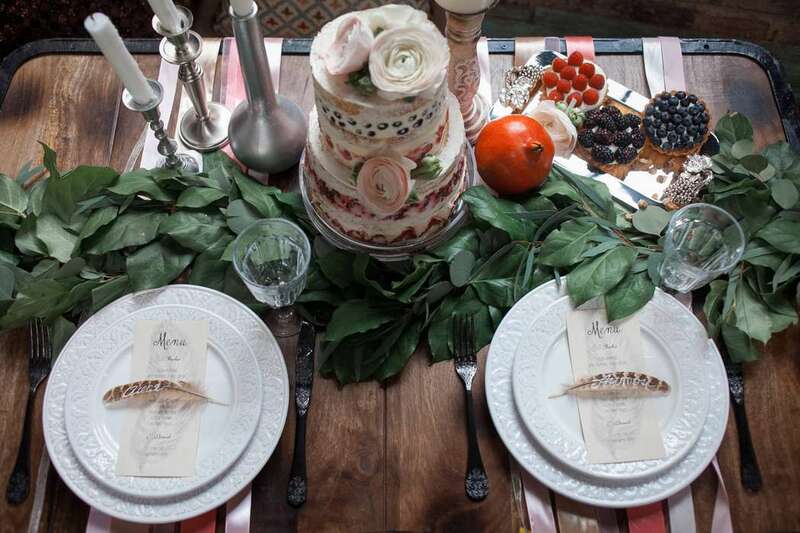 It can be red roses from napkins or lime fruit, are laid out along the Central line of the table. Anyway – the main thing is not to overdo it and not to deprive the black and white setting of her mystery, graphic appeal and charm. 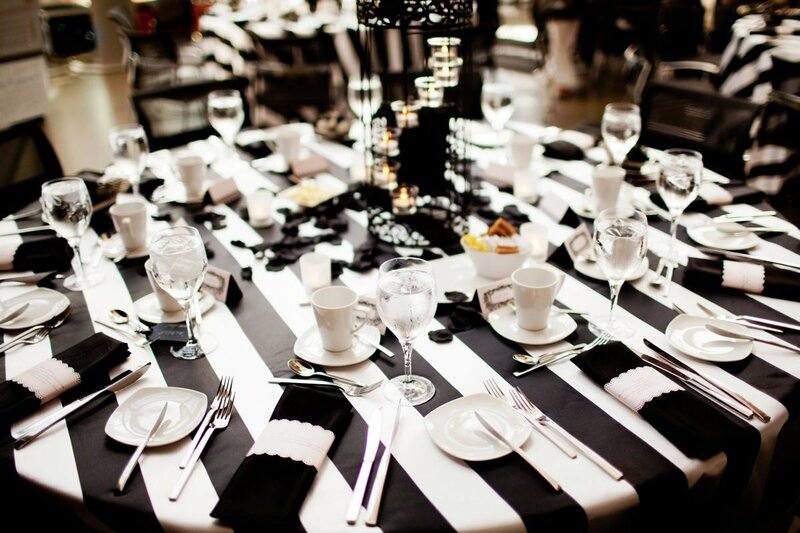 Table setting in style mafia – the possible attributes of the table without the tablecloth. 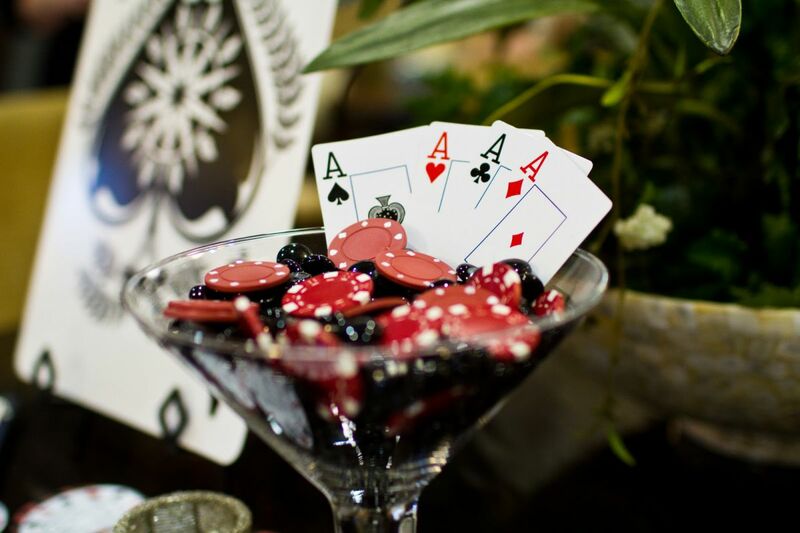 Glasses of whiskey, an ashtray with cigarette butts, a deck of cards, dice, chips, knives, guns, cigarette cases – everything associated with the sinister mafia. Arrange a holiday to my husband, and he will remember it for a long time. The variety of theme parties is very wide. Among them are excellent options for holding a birthday girls and boys, wedding events, where a lot of the nuances and the climax appears a cake with a picture of the bride and groom. The couple will always remember such a wonderful wedding. 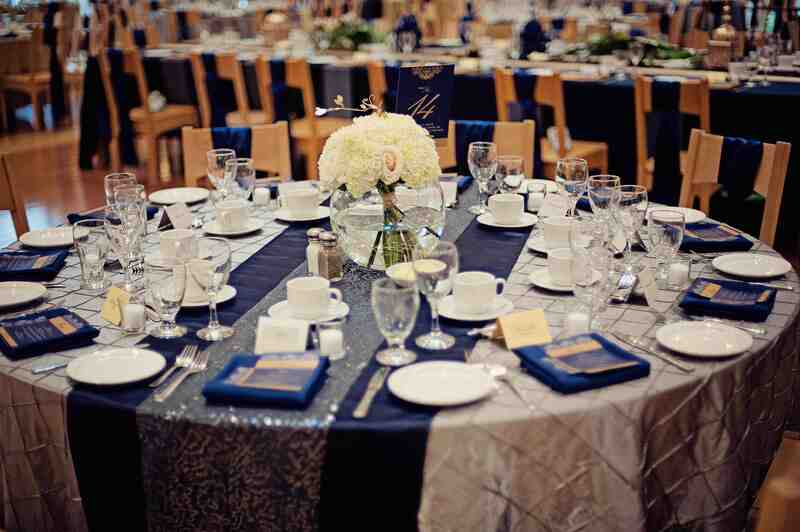 pirate style – be sure to support the marine theme with a blue or blue tablecloth. The cloth with the image of a treasure map is a godsend to this party. 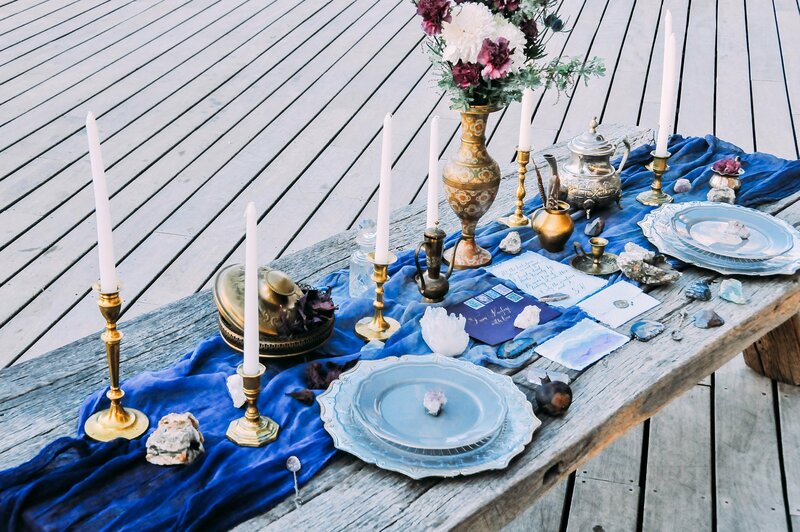 In the middle of the table you can place a pirate’s chest from which poured gold jewelry and precious stones. Cards can be issued in the form of black mark. 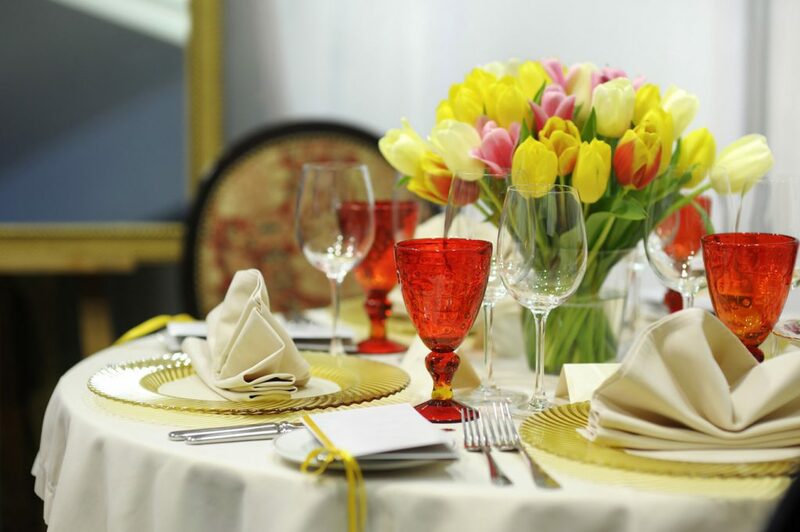 Competent, beautiful and creative table setting is the key to success of any celebration.